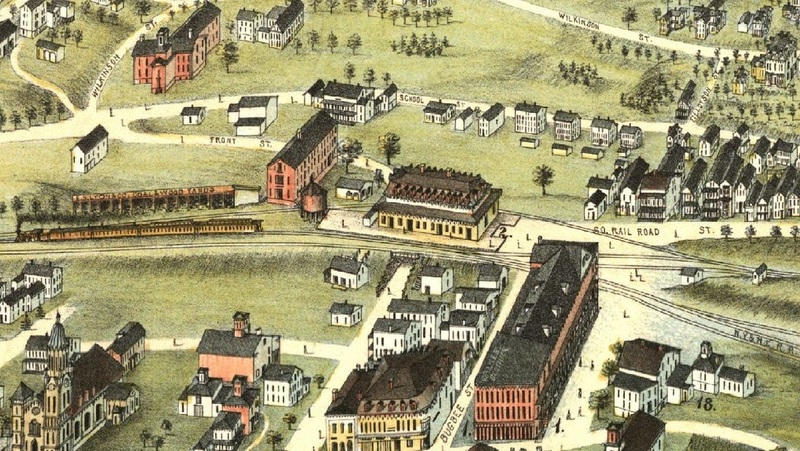 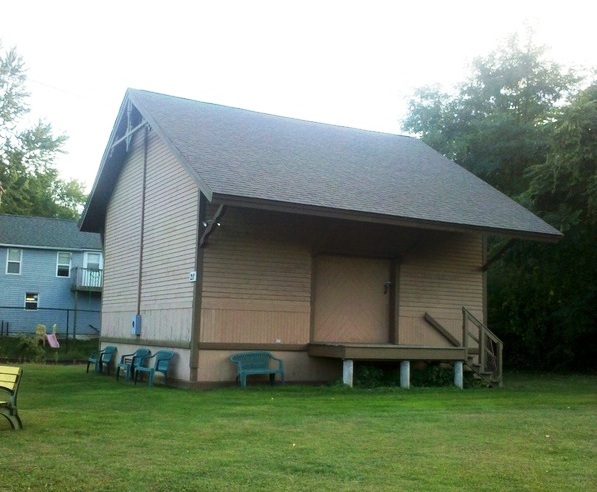 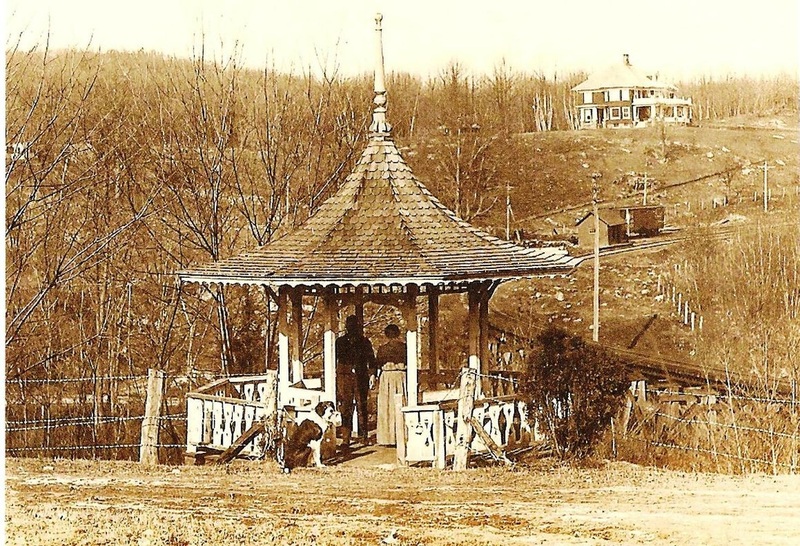 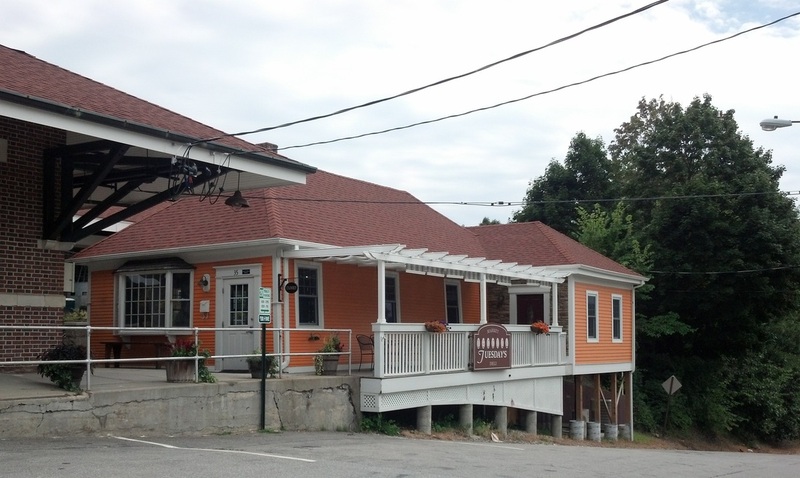 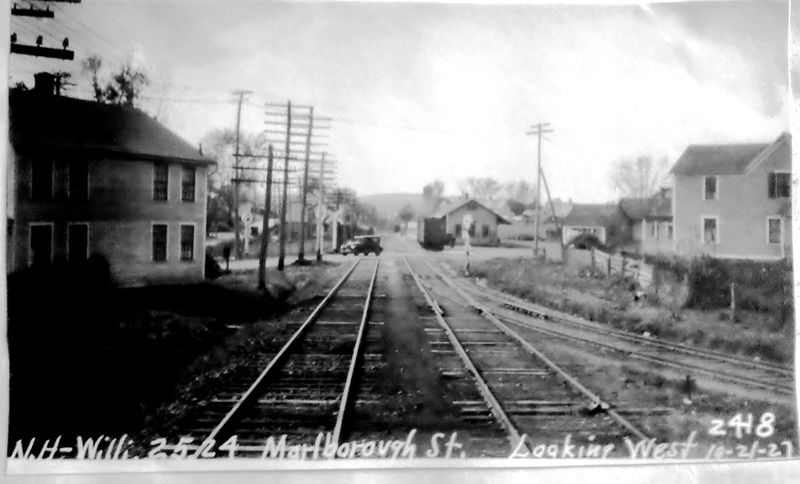 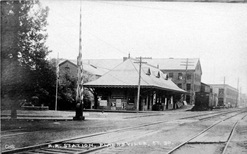 This stop was established in the town of WATERTOWN in 1870 when the Waterbury and Watertown railroad opened. 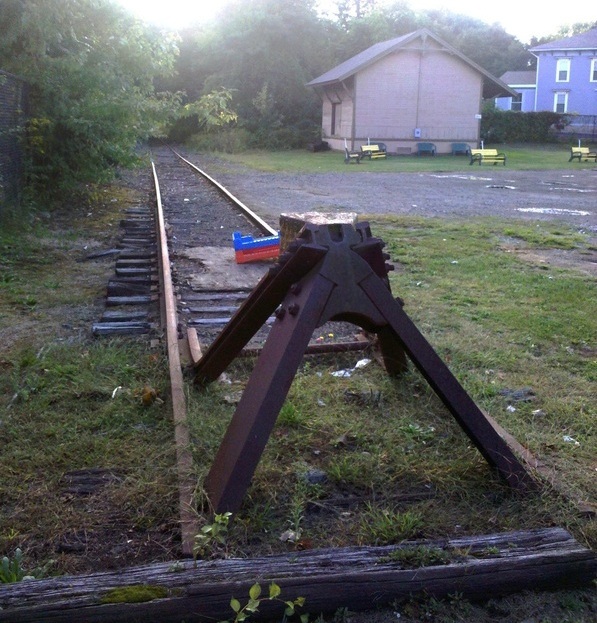 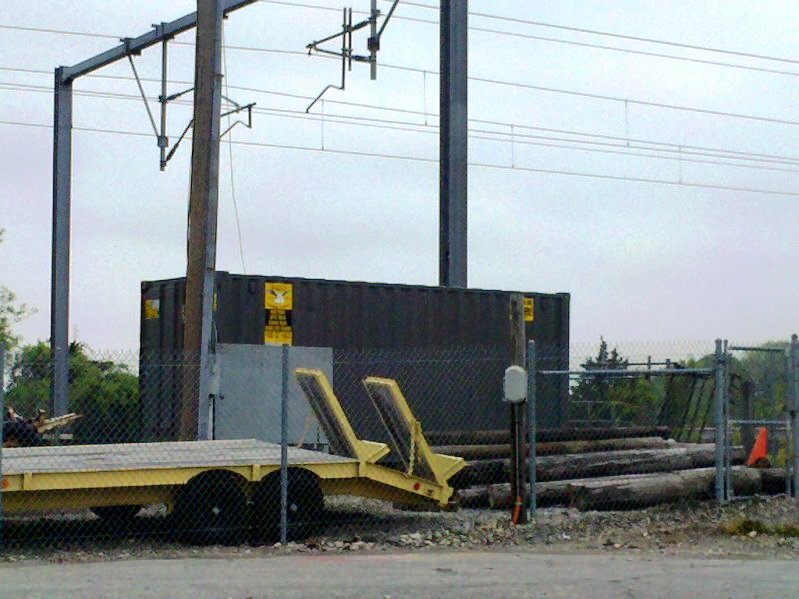 We have no photo yet of the first station which was reportedly near the site of the second depot. 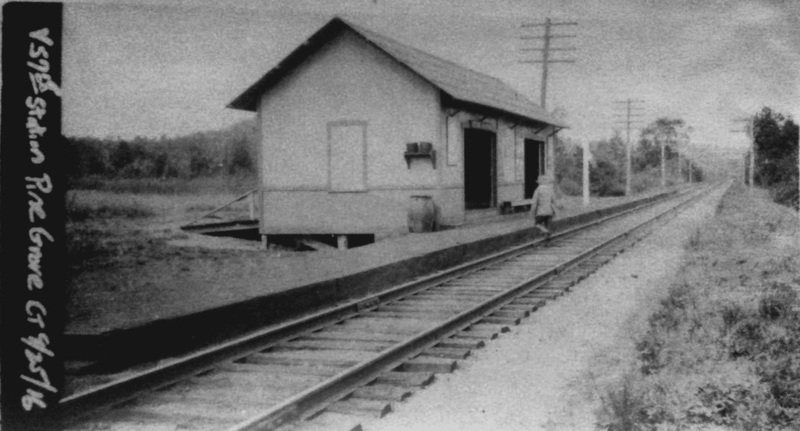 Chronologically, the second station in this village was built by the CW. 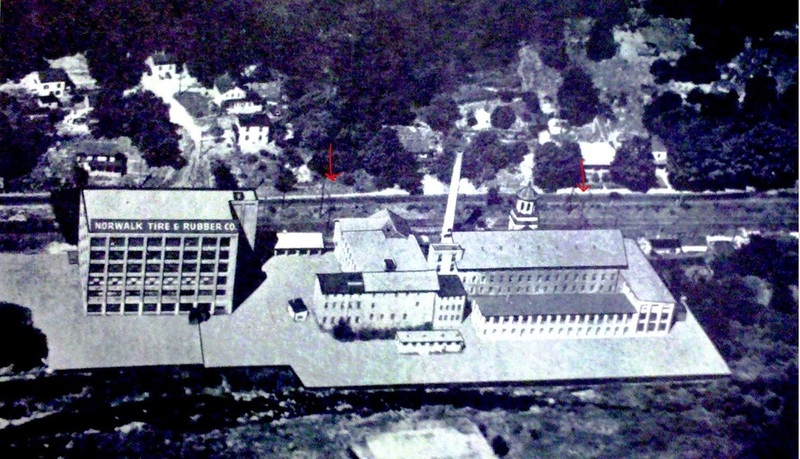 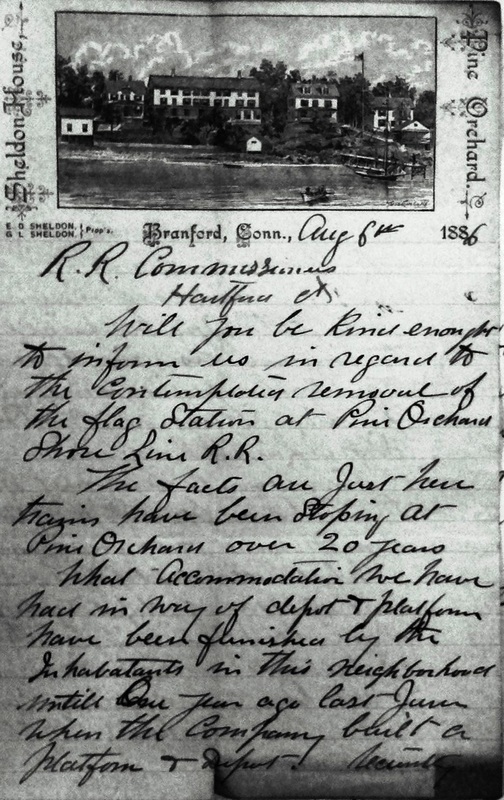 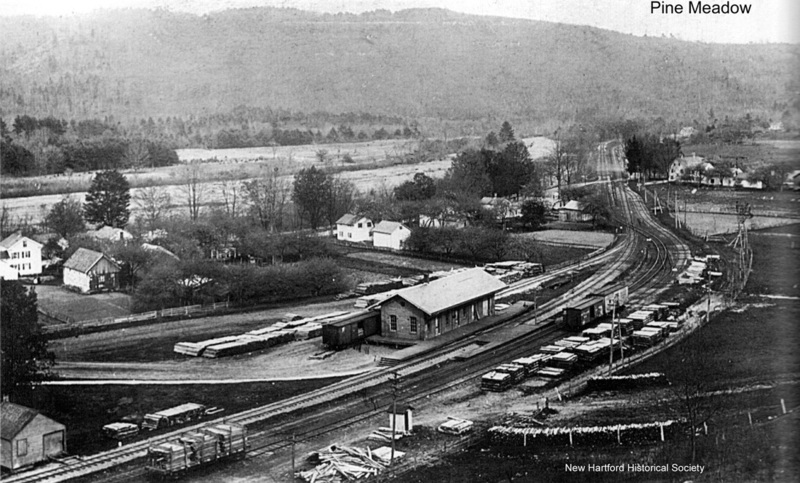 The Courant said this was a flag stop initially but the Winsted Herald reported that a depot here was almost complete late in 1871 when the railroad opened. 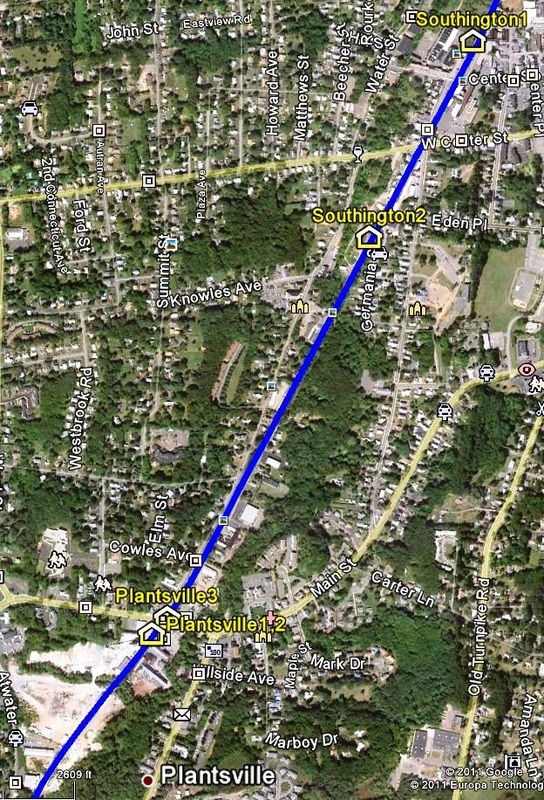 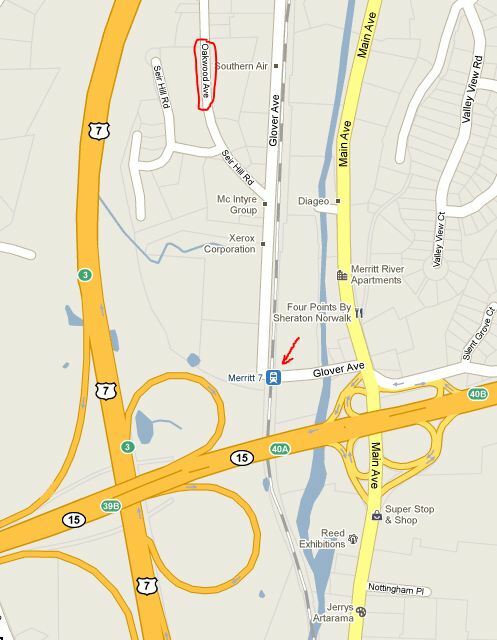 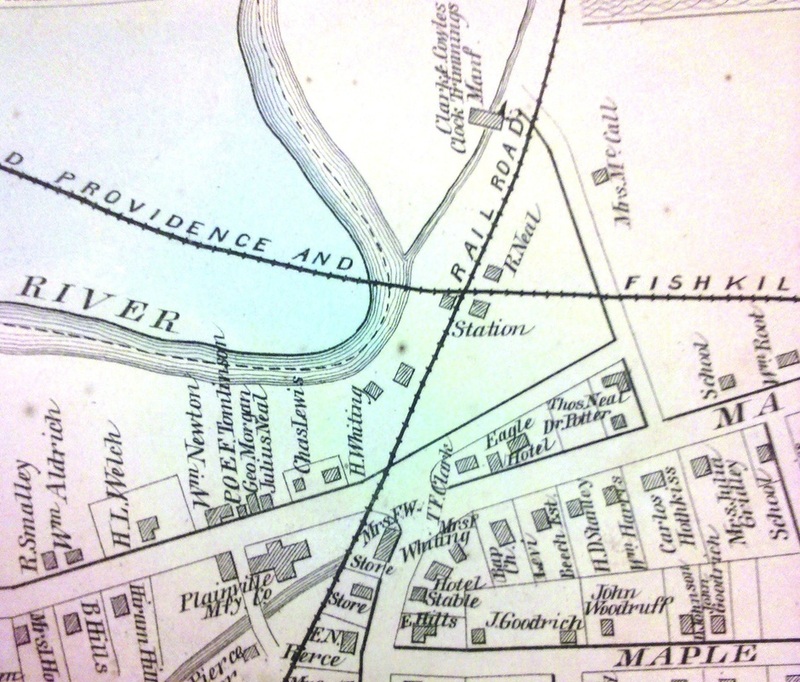 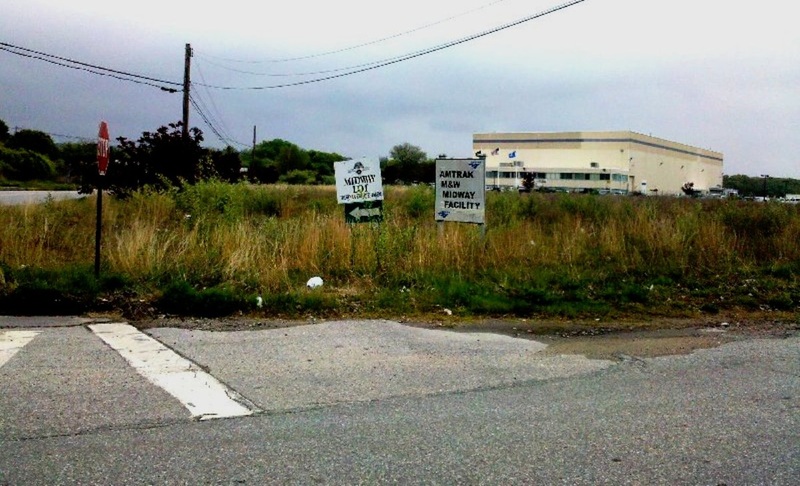 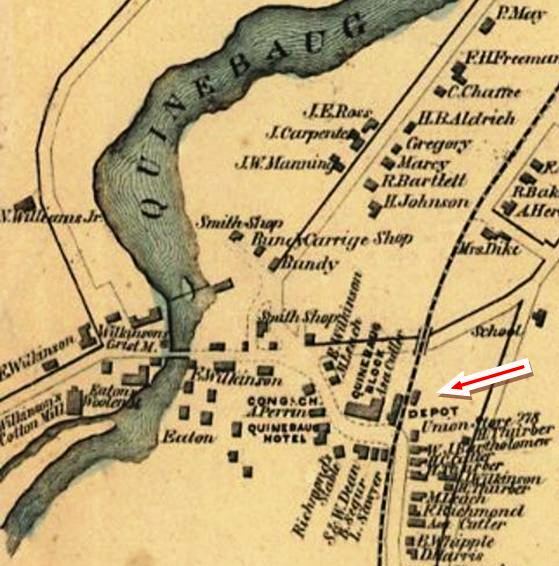 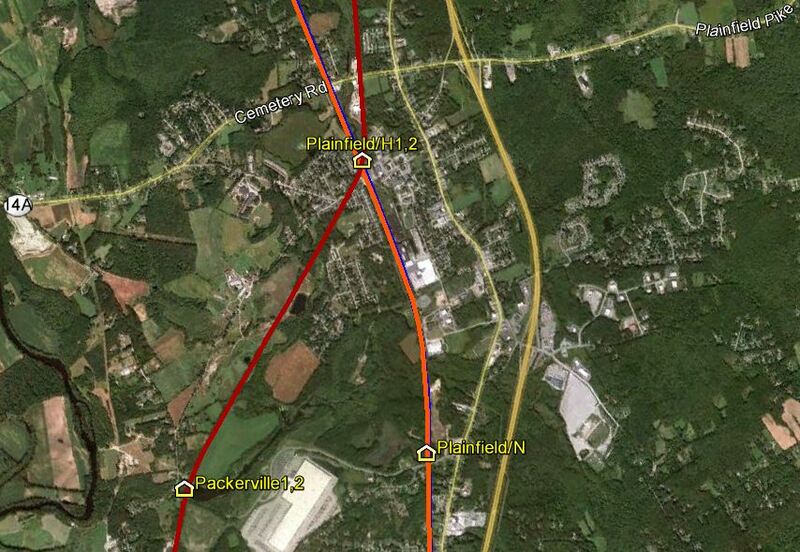 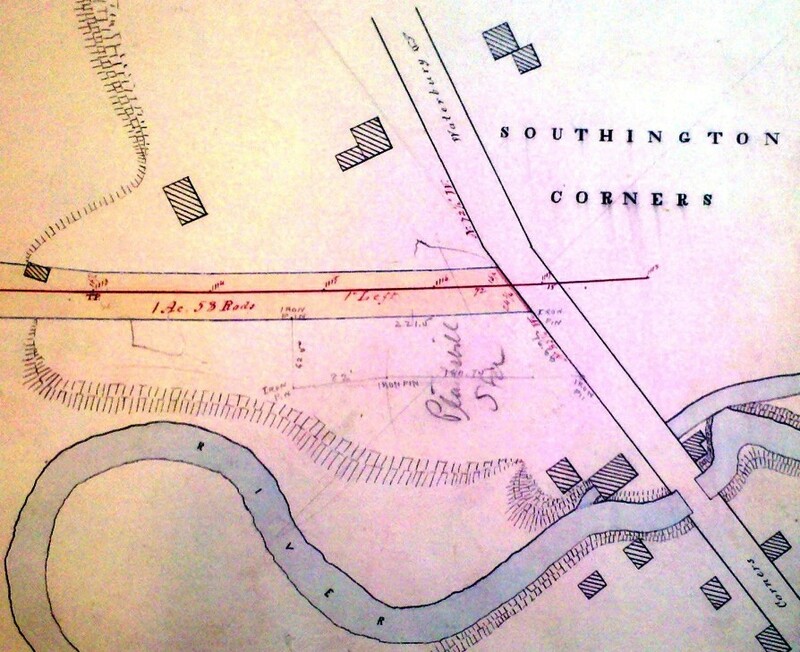 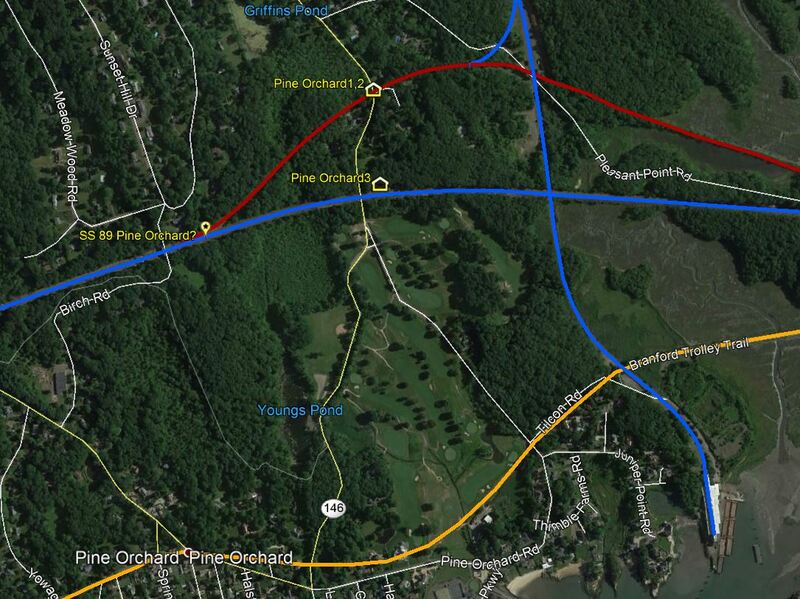 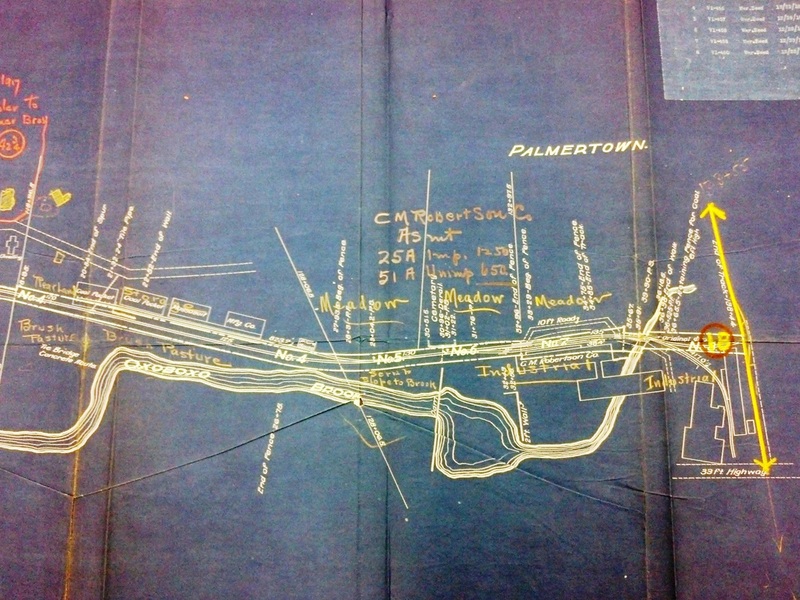 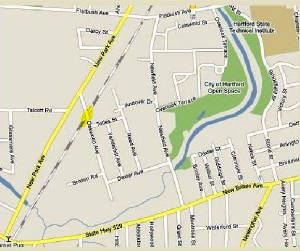 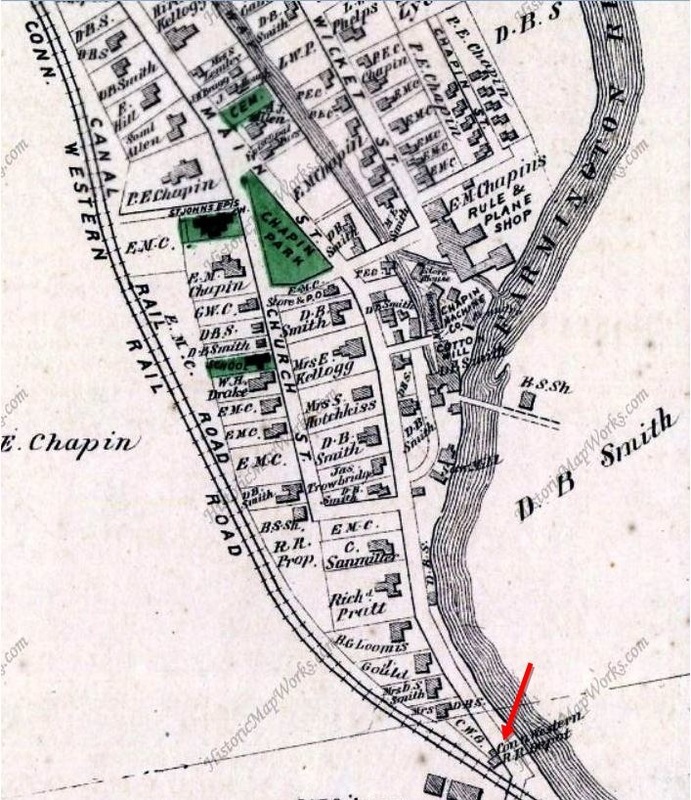 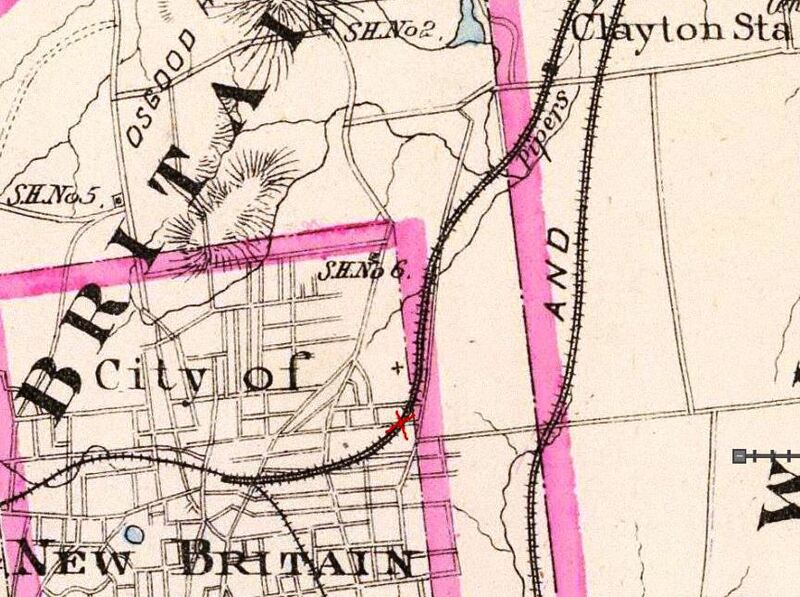 The real estate map of that same date at  seems to show the location right at the Albany Tpke. 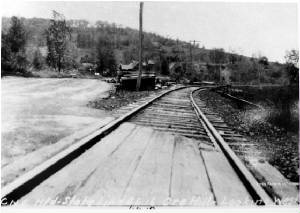 crossing, as Bob Lord asserts, though with no building shown yet. 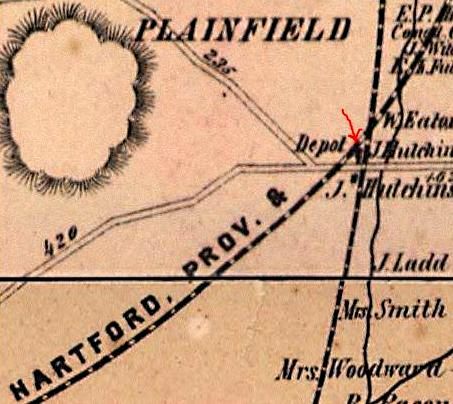 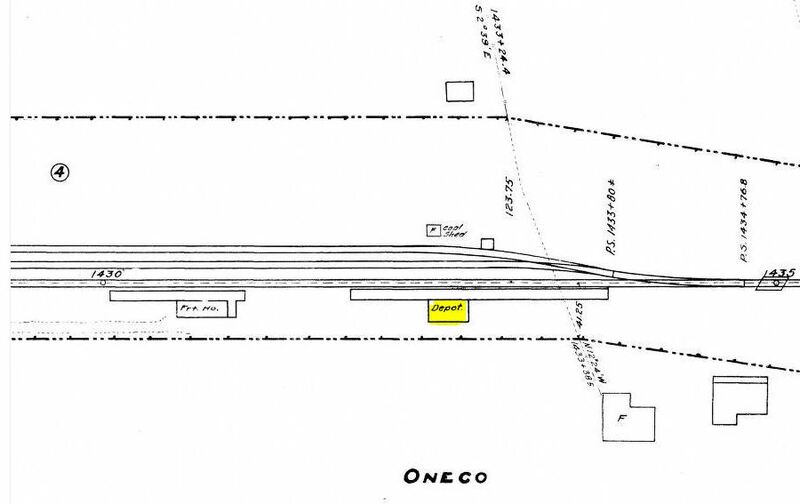 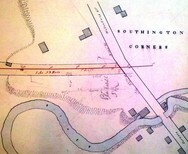 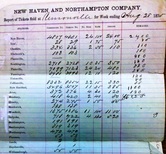 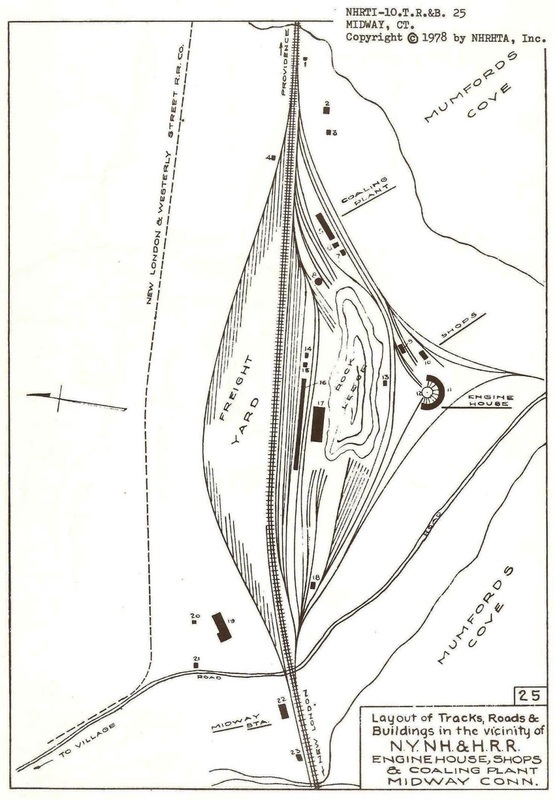 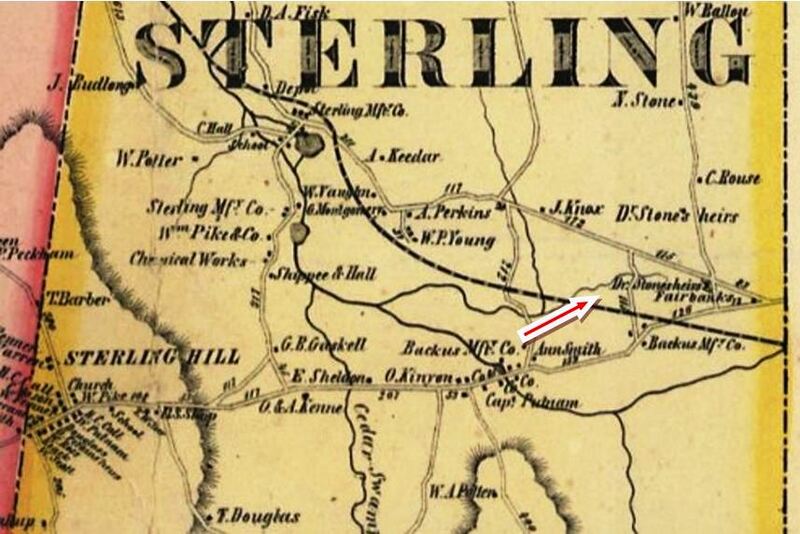 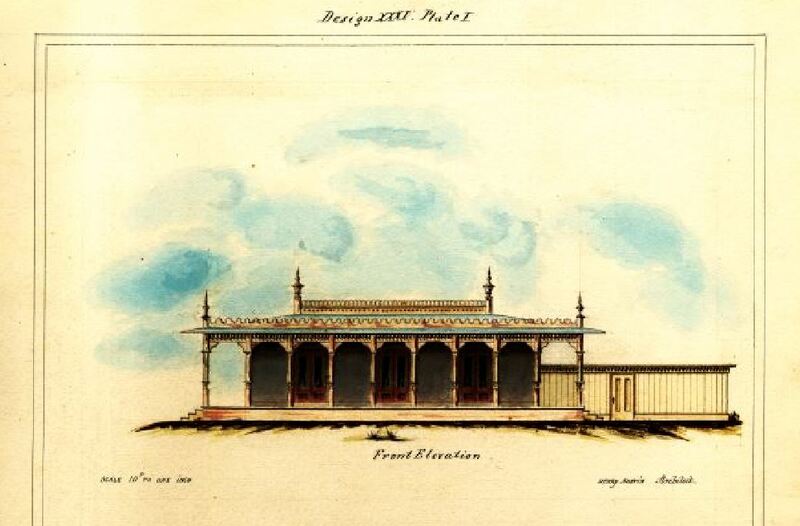 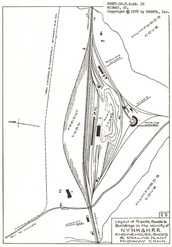 Note the 1877 NH&N depot pencilled in below. 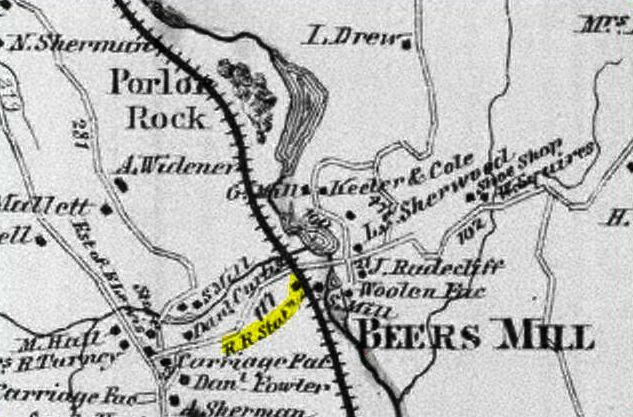 By the 1874 Beers map at  the CW depot is clearly indicated but actually on the wrong track. 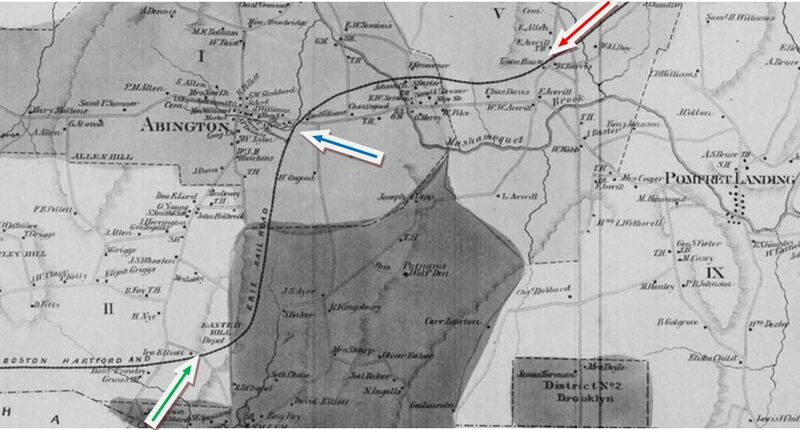 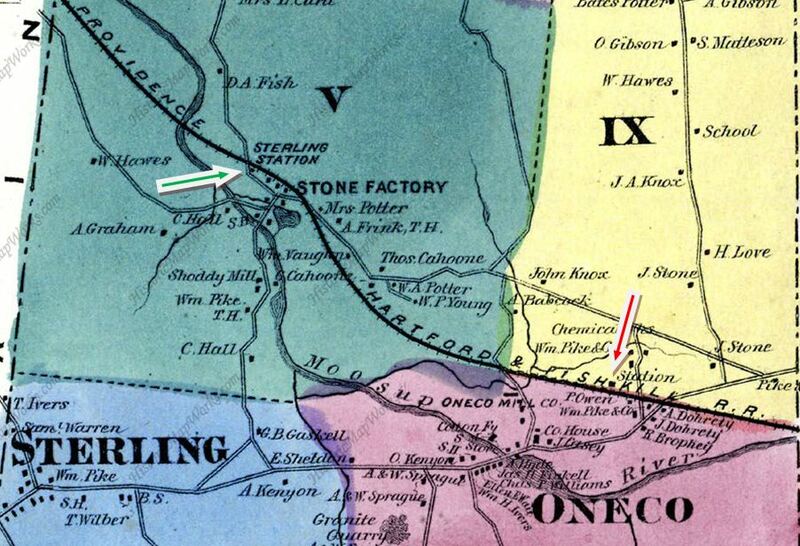 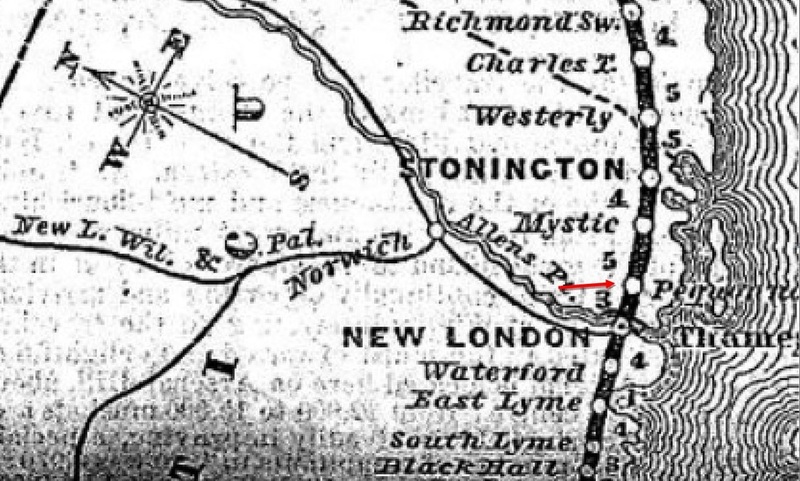 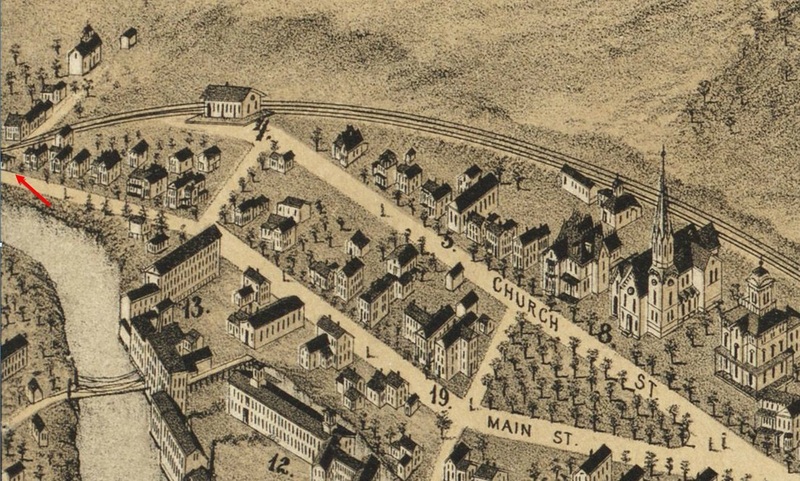 The swapping of ROWs between the CW and the NH&N, both building in 1870, is mentioned in the newspapers and may be responsible for confusion on the map, which also does not indicate the crossover. 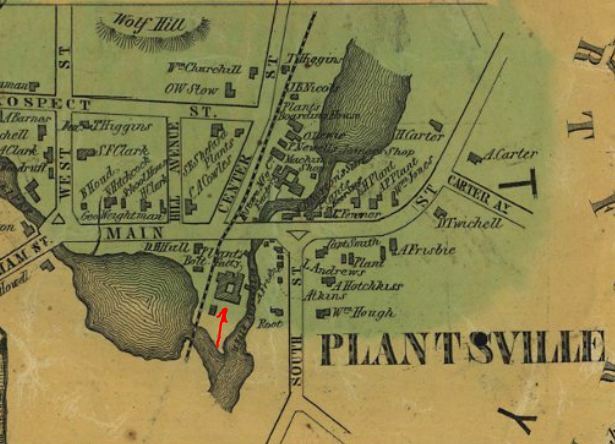 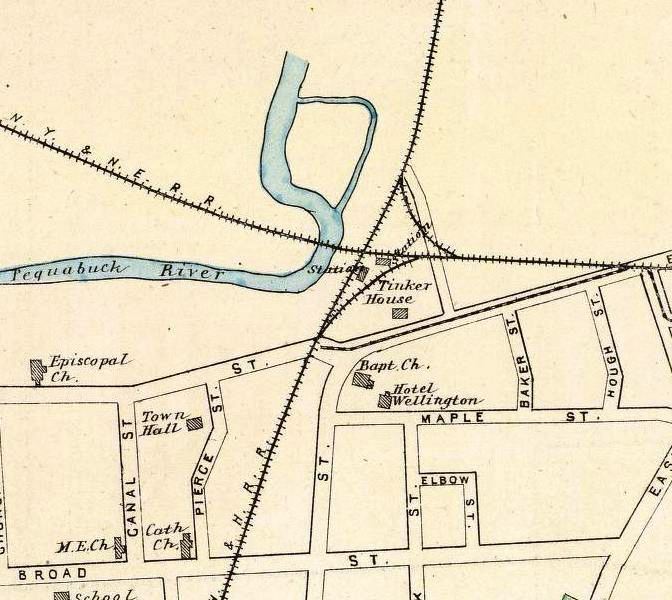 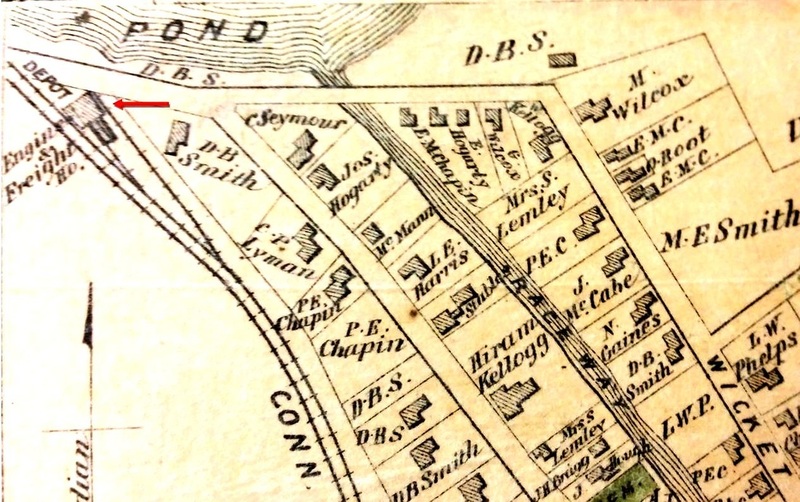 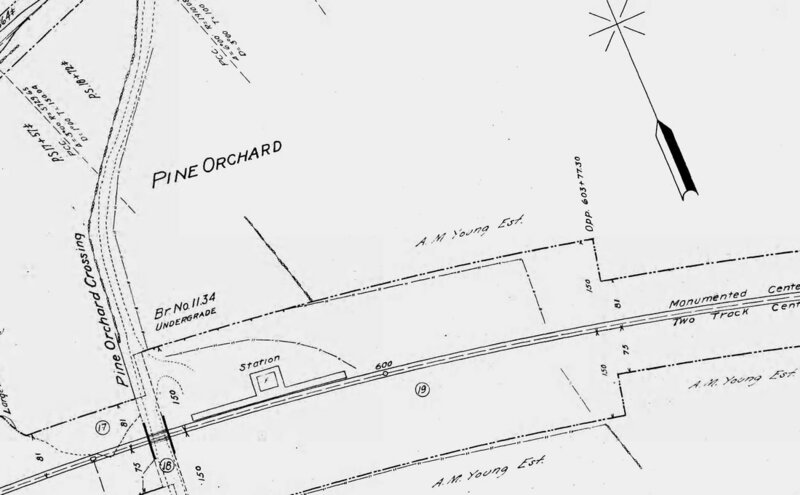 Mr Bailey's 1878 map at  does us an unfortunate injustice here by cutting off the building that might have been PINE MEADOW/C1 depot where our arrow points at middle left. 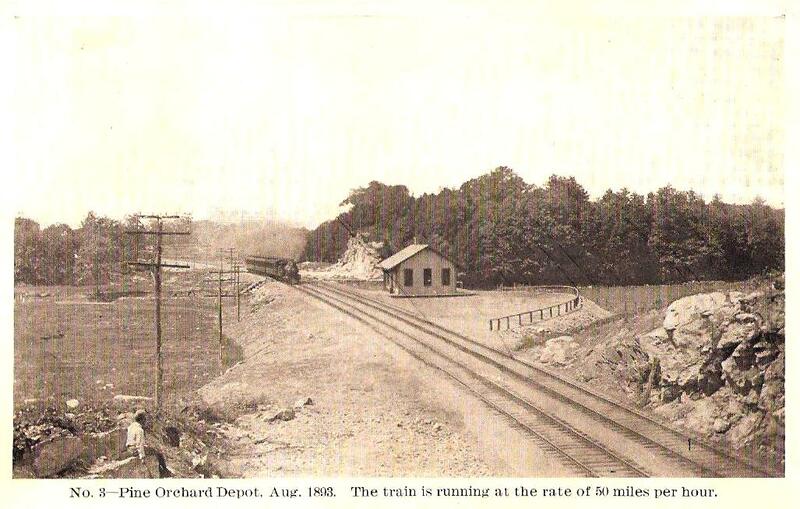 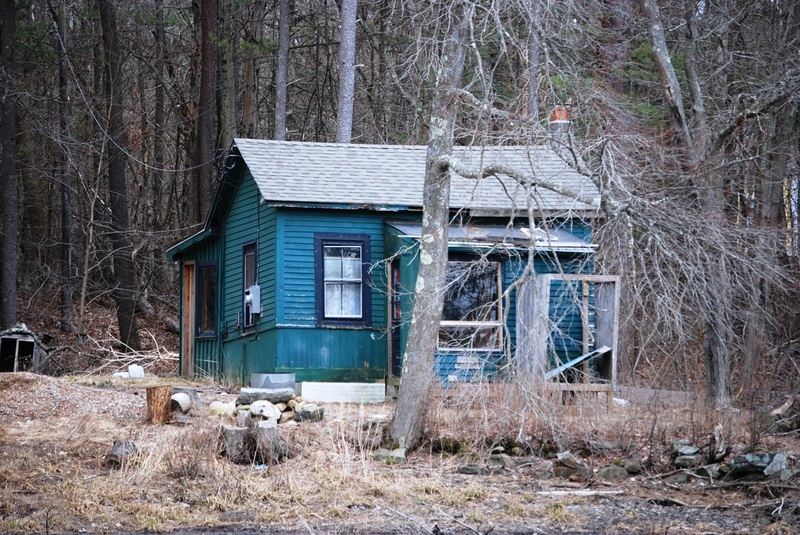 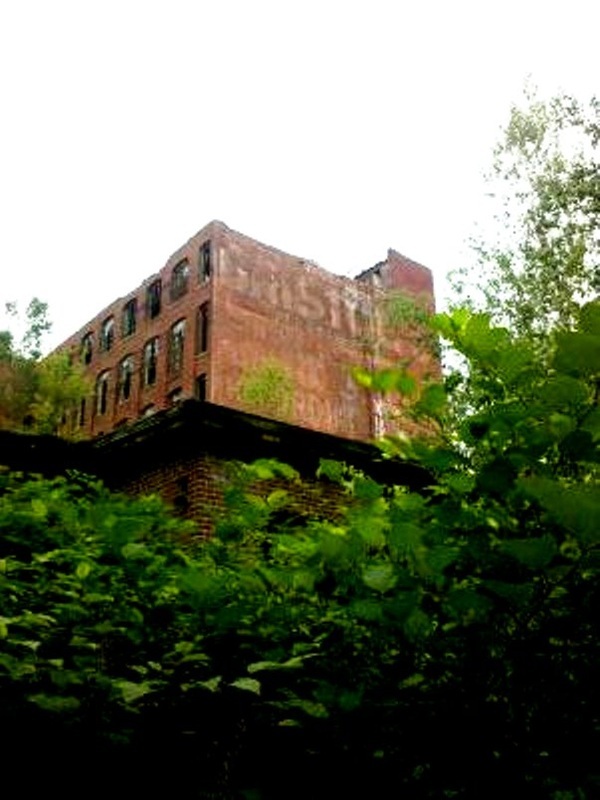 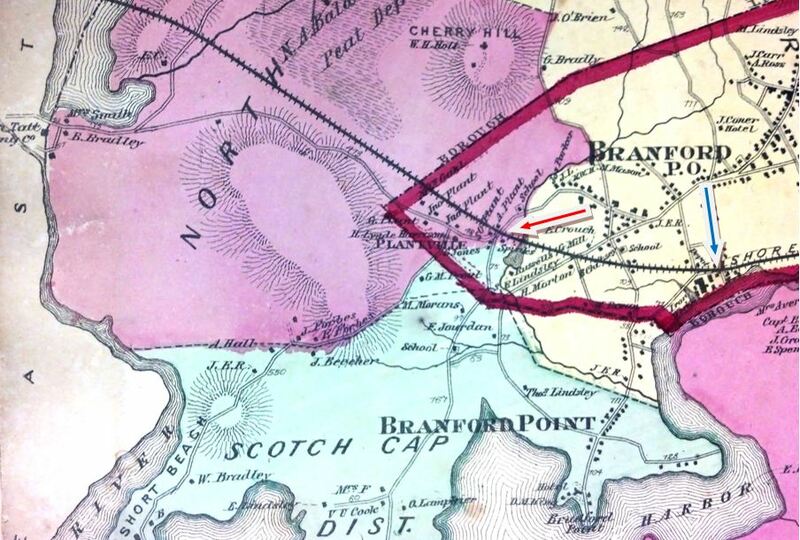 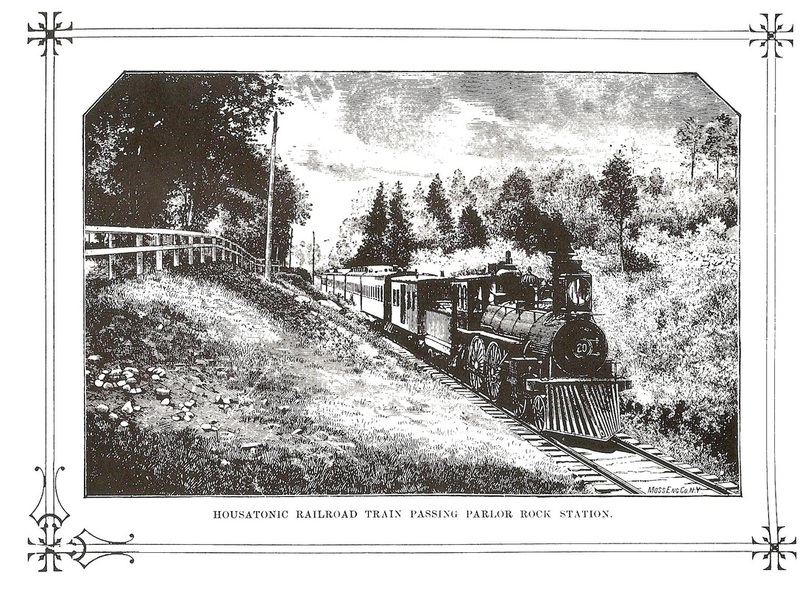 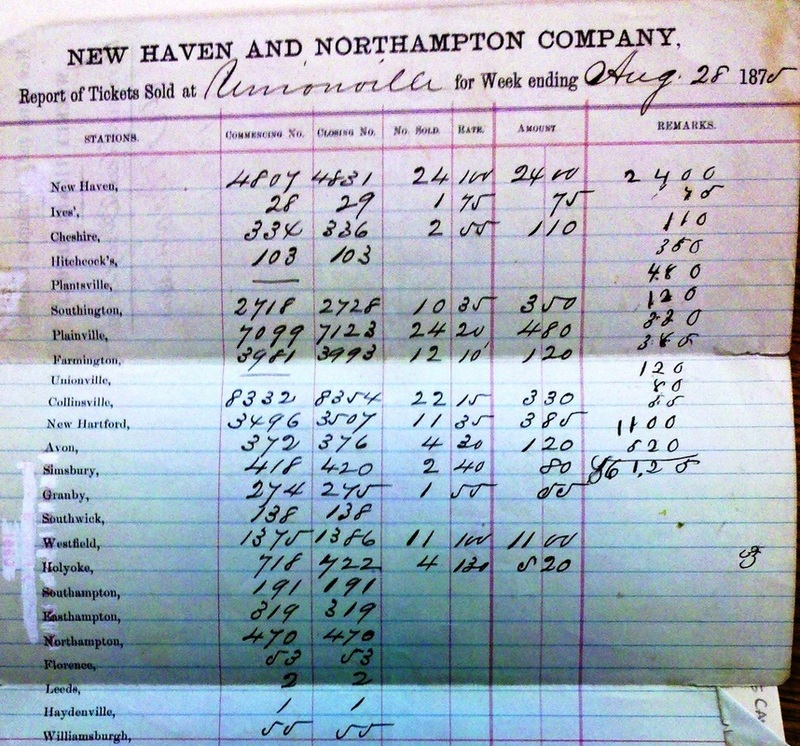 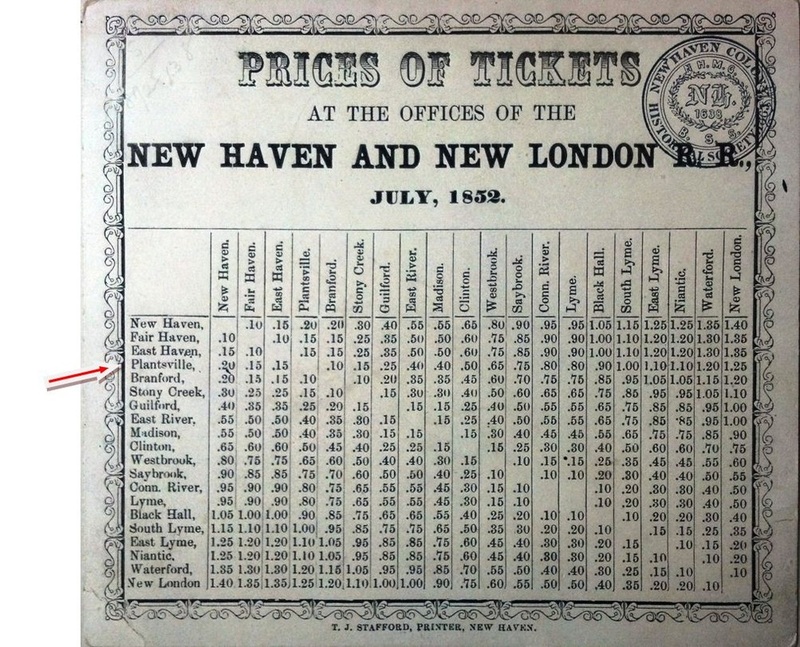 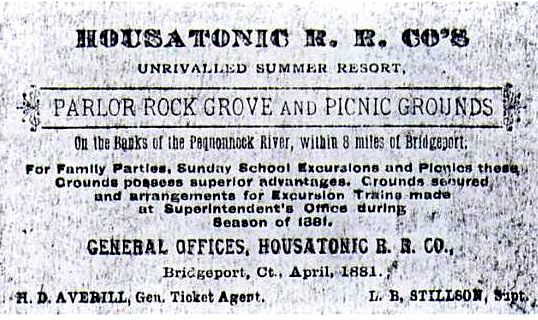 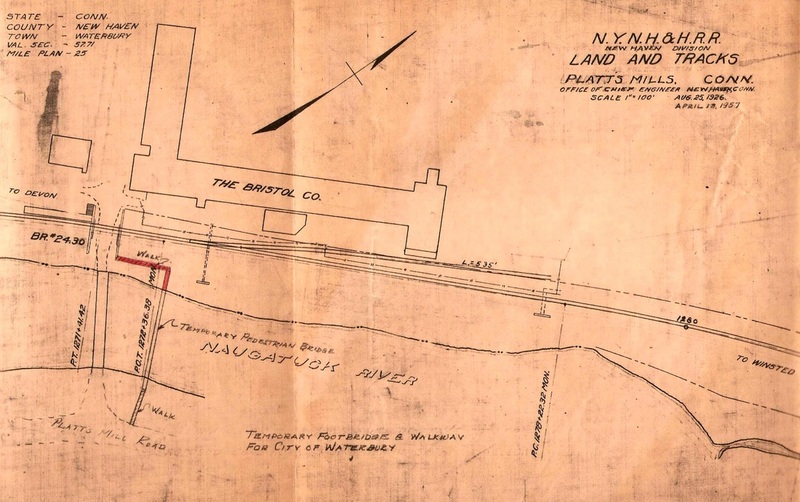 The 1880 NY&NE appraisal of CW property said there was a small structure here to serve both passengers and freight valued at $175, compared to BLOOMFIELD which it appraised at $1500. 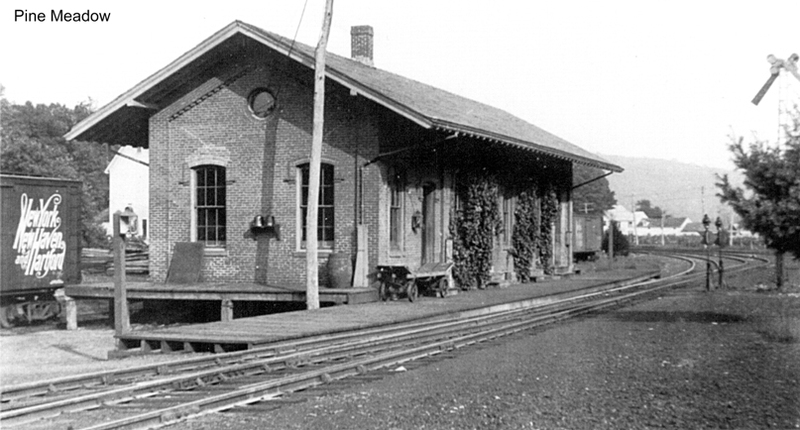 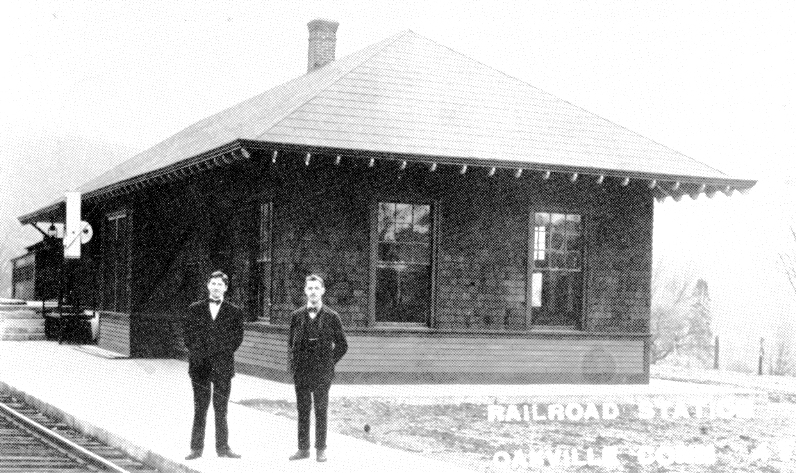 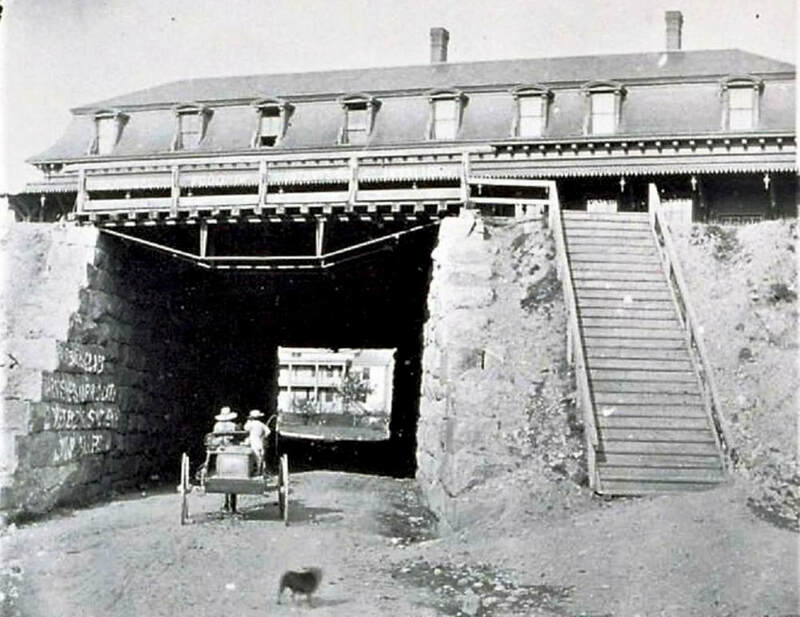 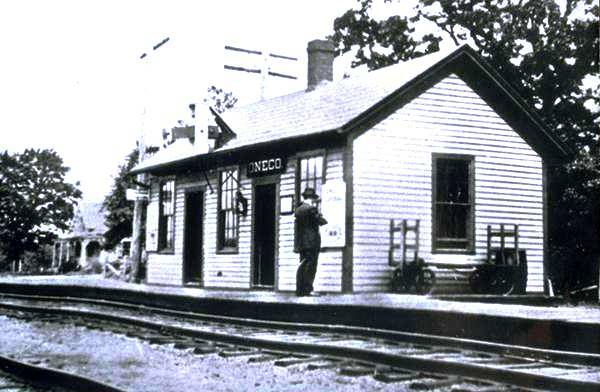 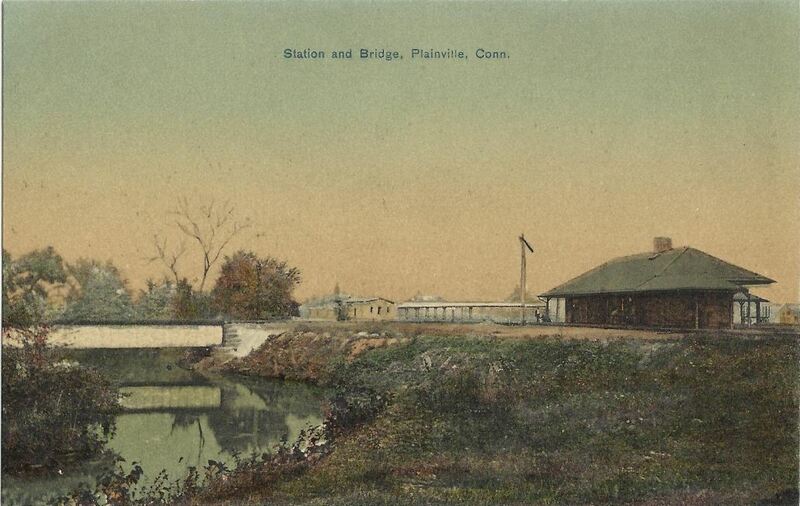 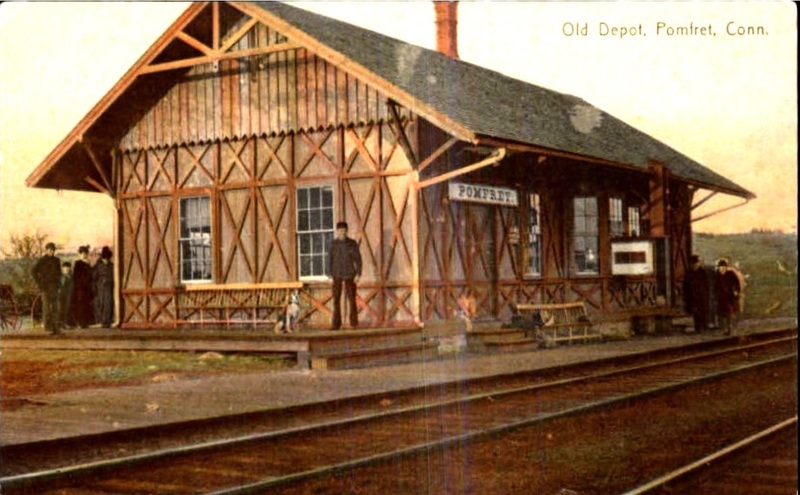 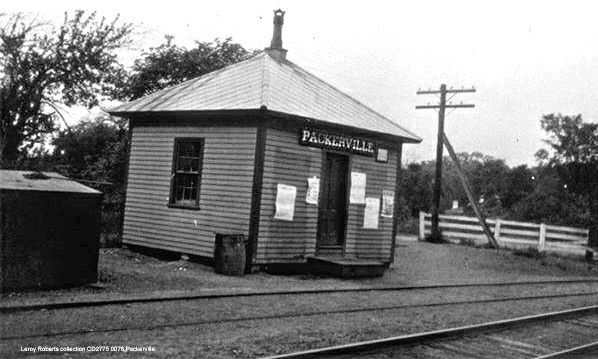 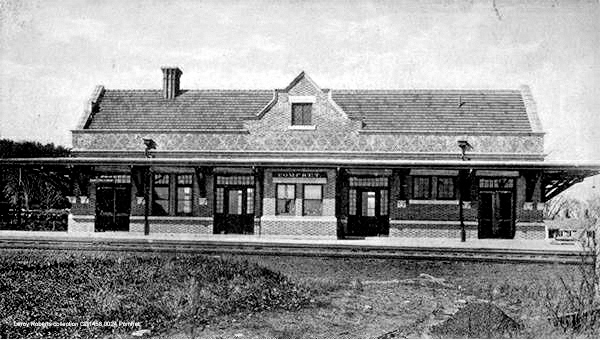 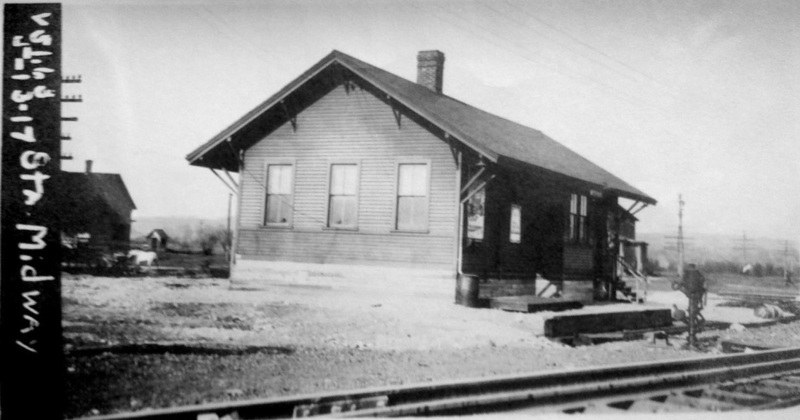 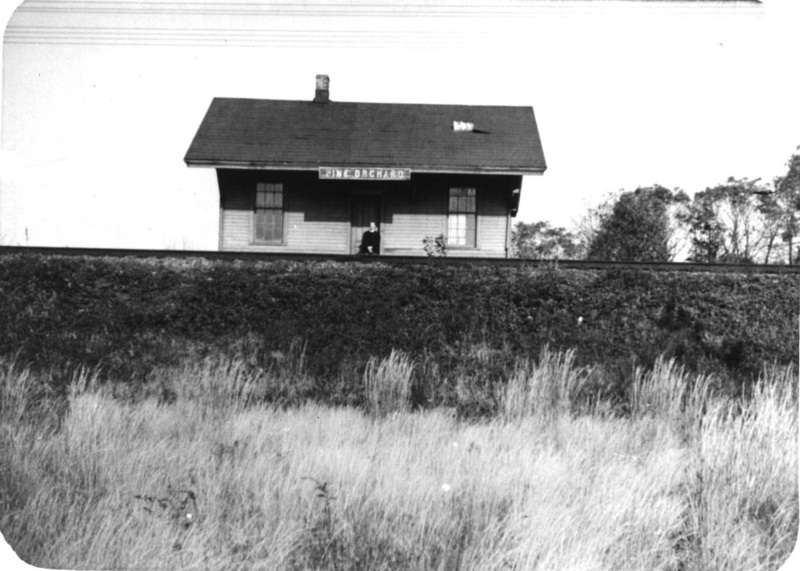 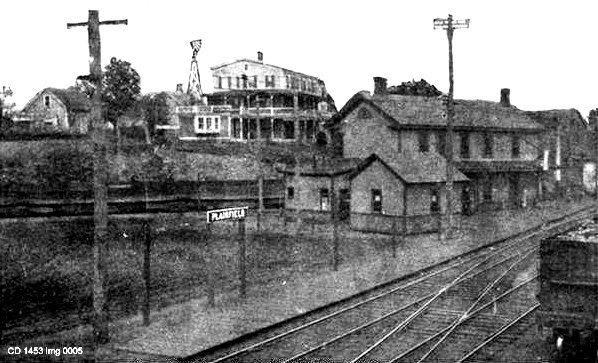 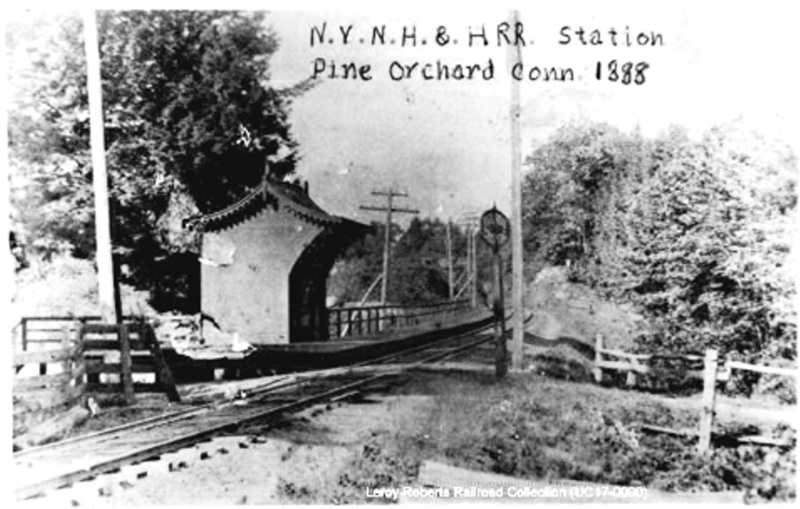 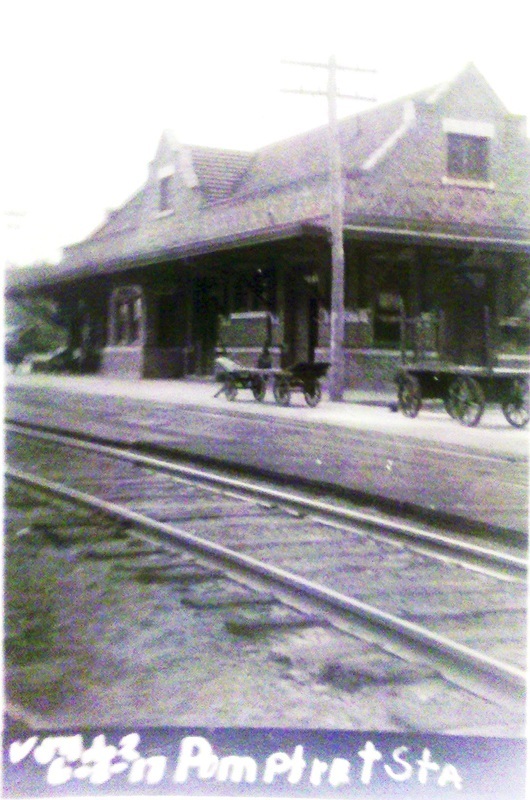 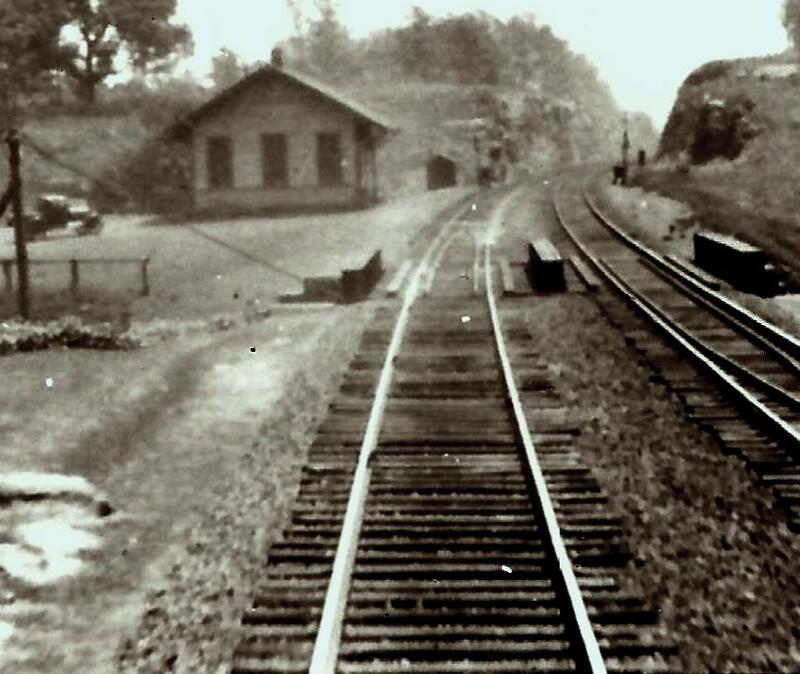 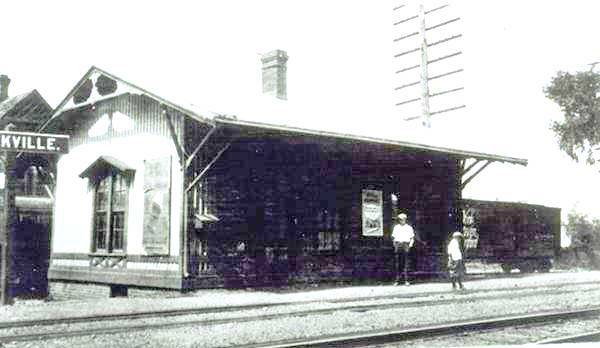 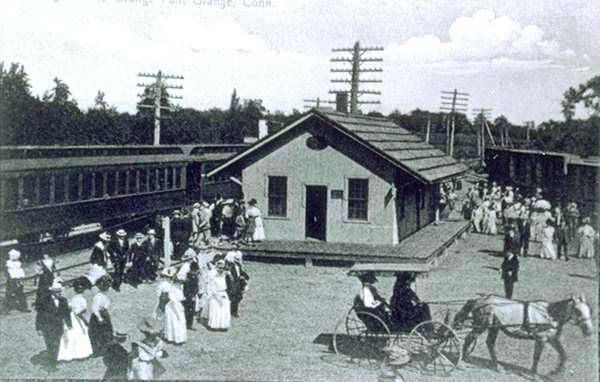 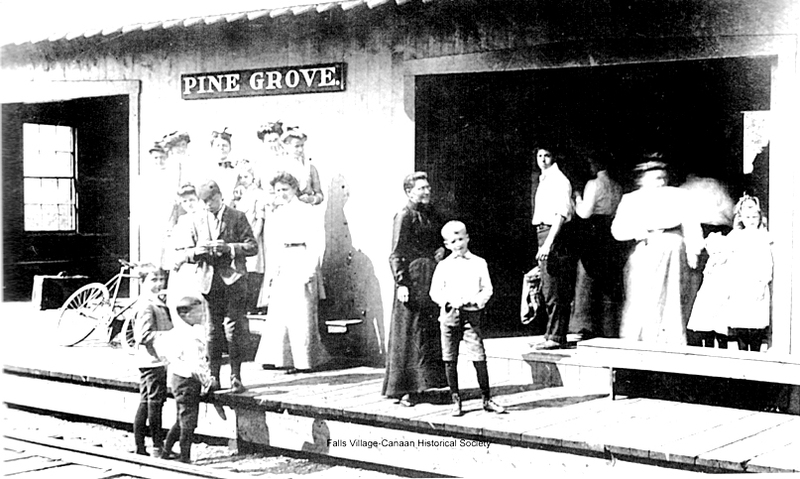 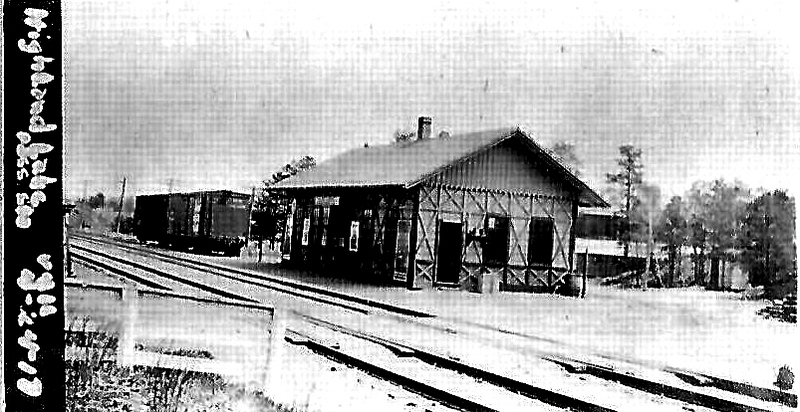 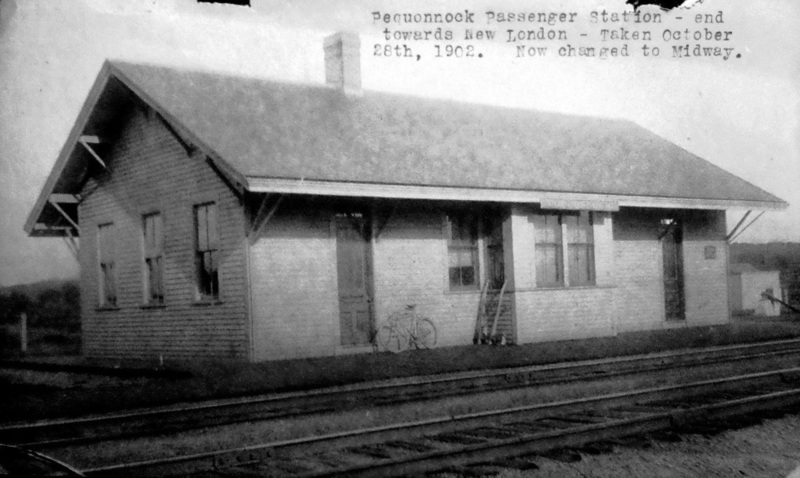 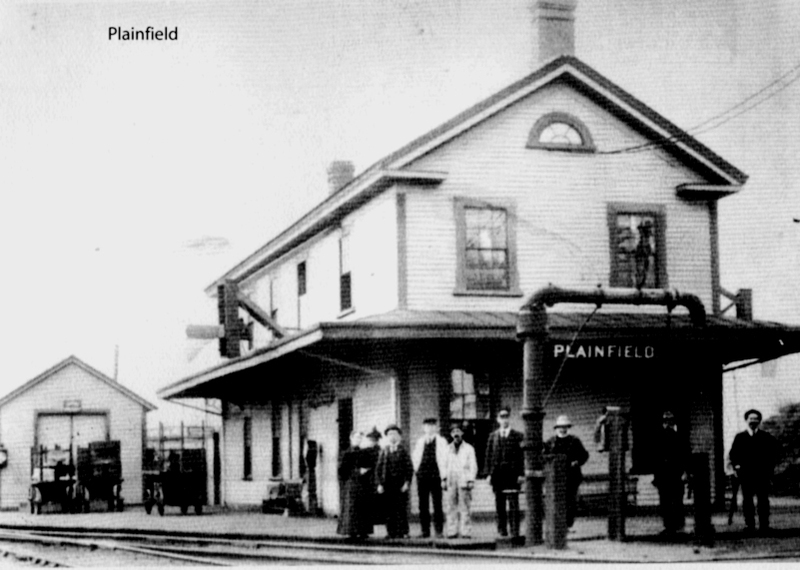 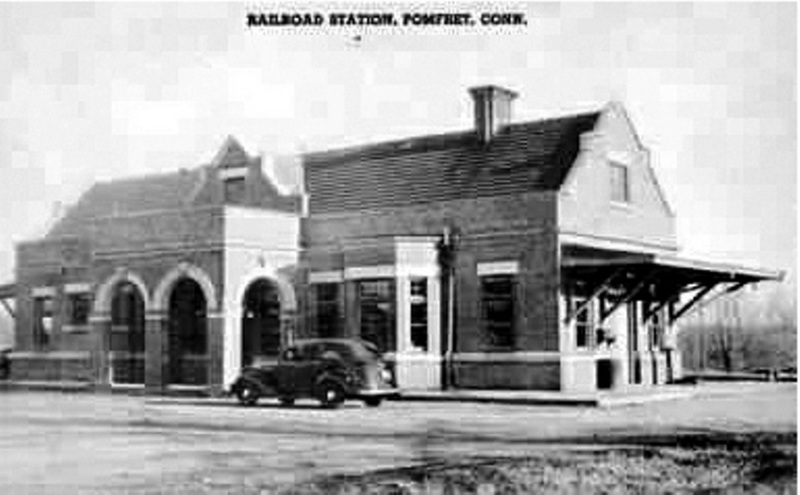 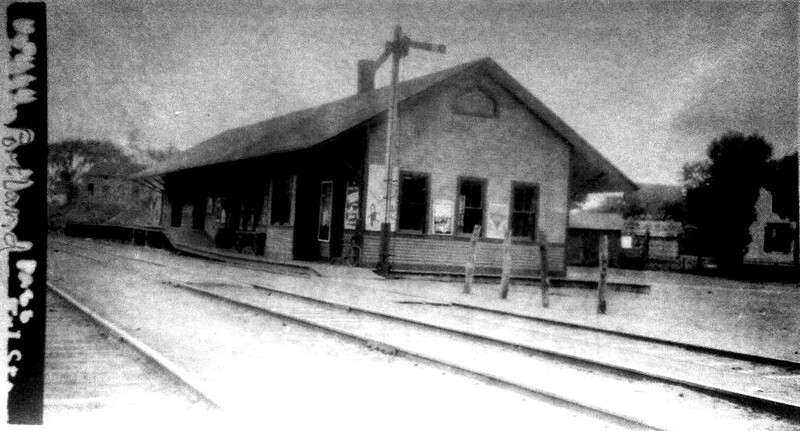 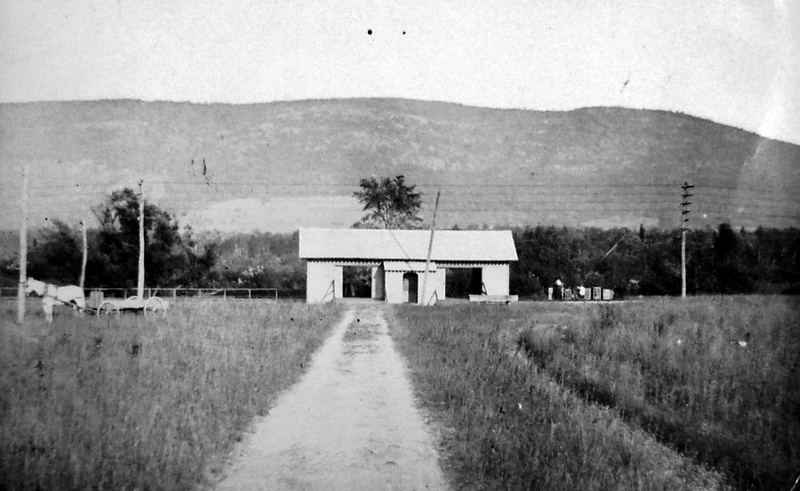 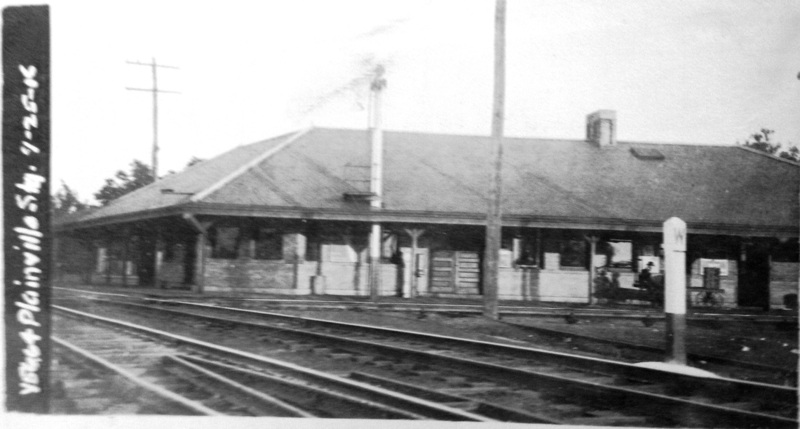 The fate of this station, when it was replaced by PINE MEADOW/C2 in 1894, is unknown. 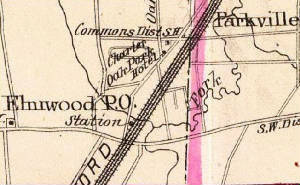 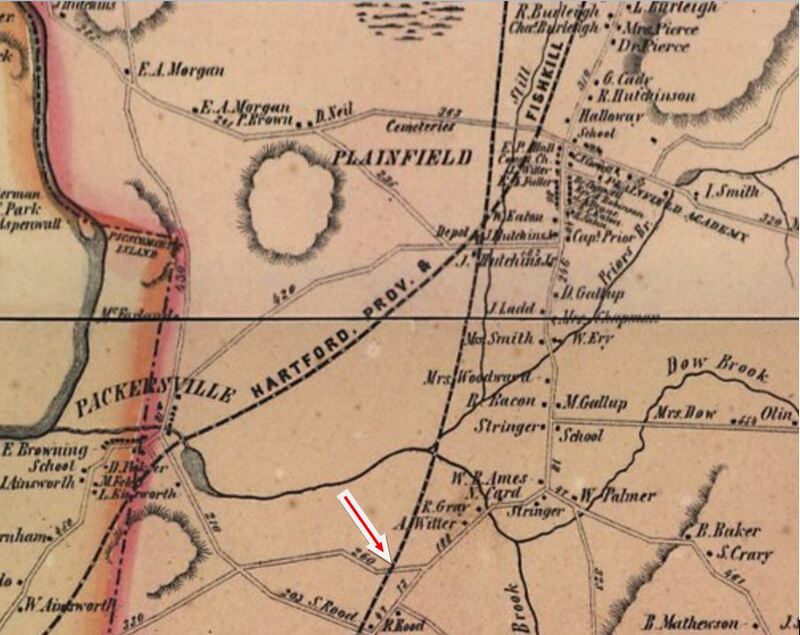 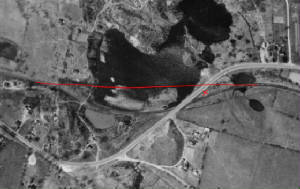 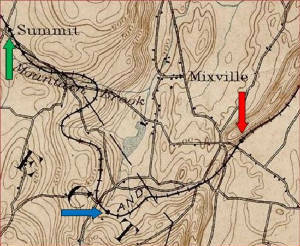 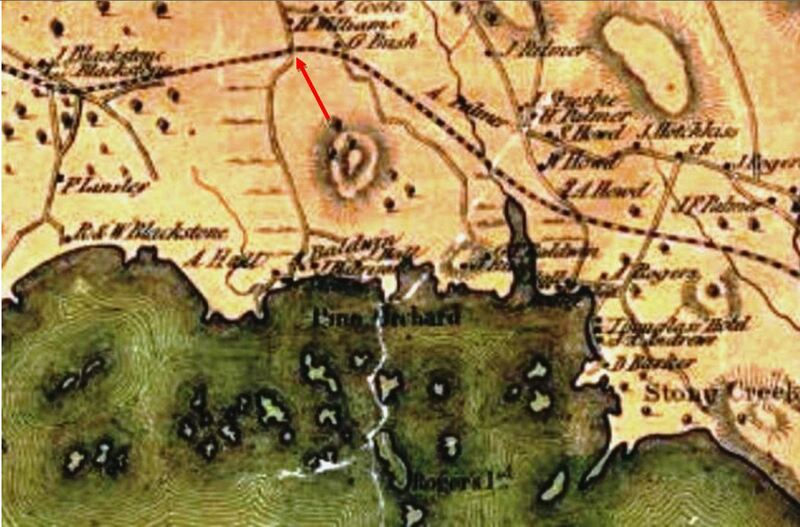 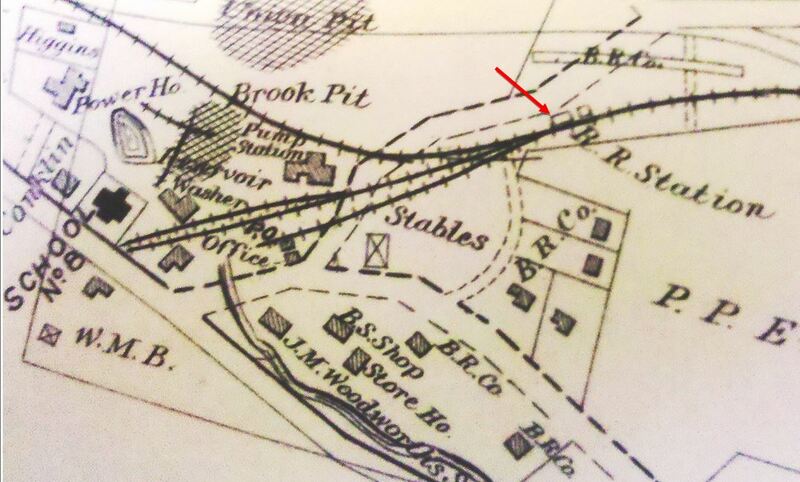 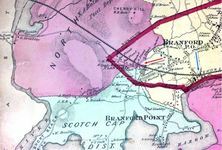 This station on the MW&CR is shown by the blue arrow on the 1892 topographic map in between WEST CHESHIRE and SUMMIT. 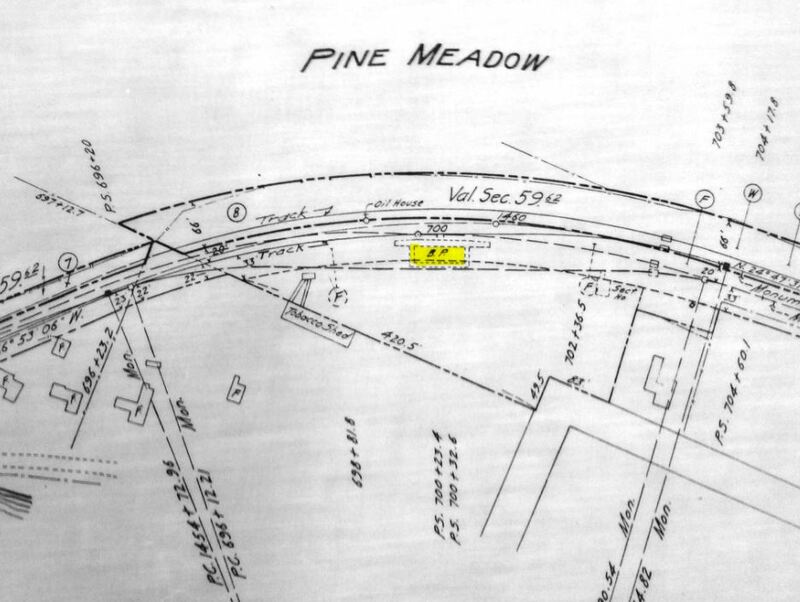 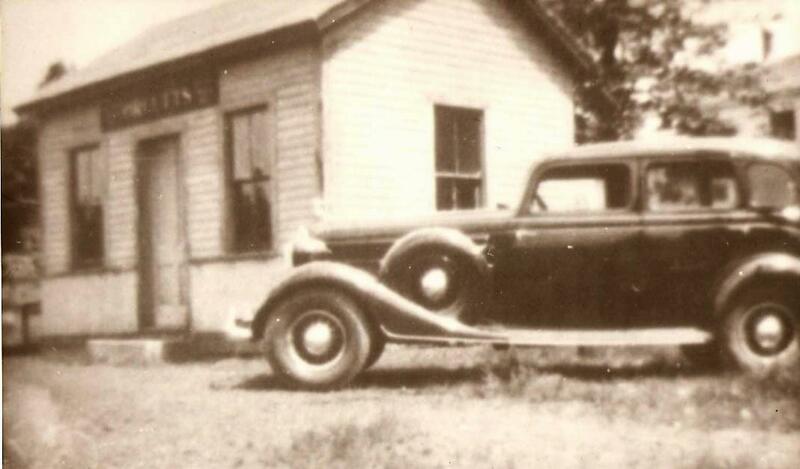 We are pretty sure that the tick mark is a bit misplaced since the property owner across what is now Rte. 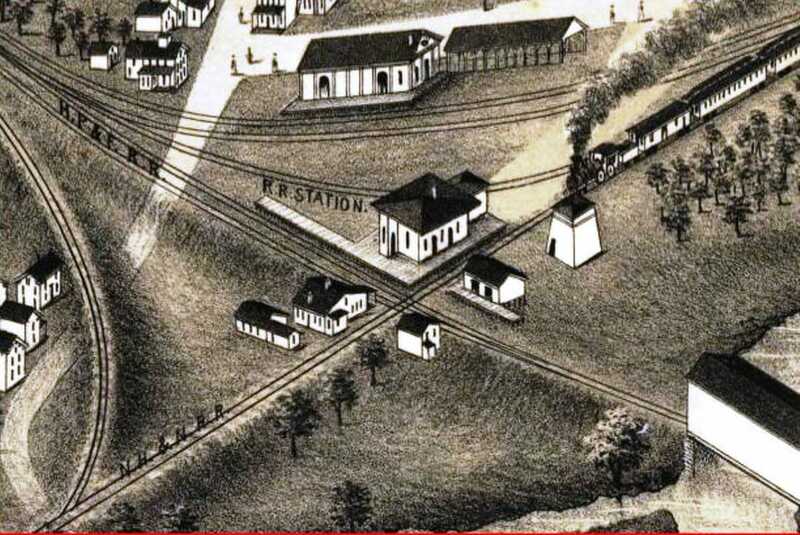 68 testifies to the fact that the station was on his land. 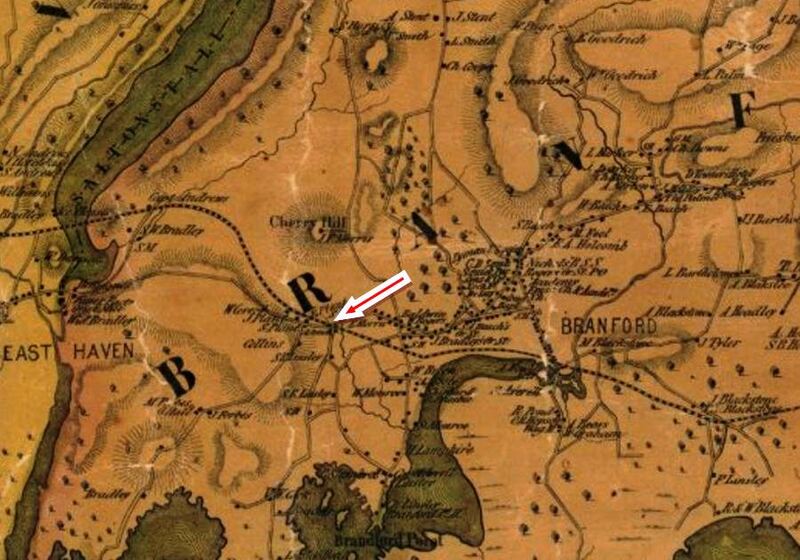 It stood where the capital on the letter C is on the map. 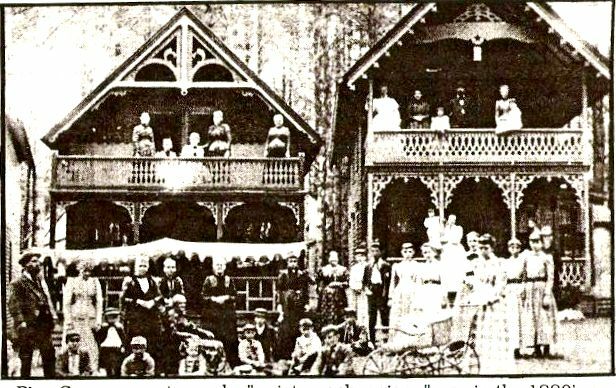 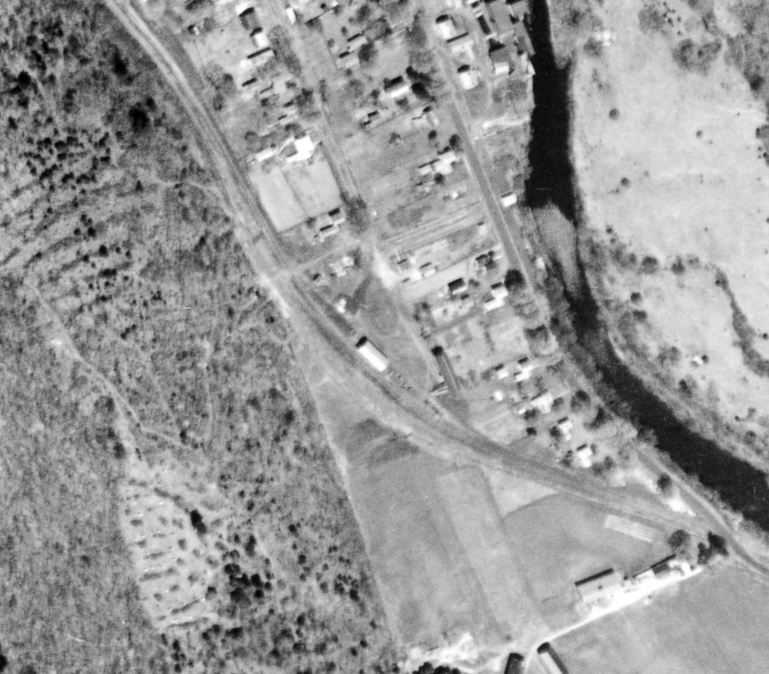 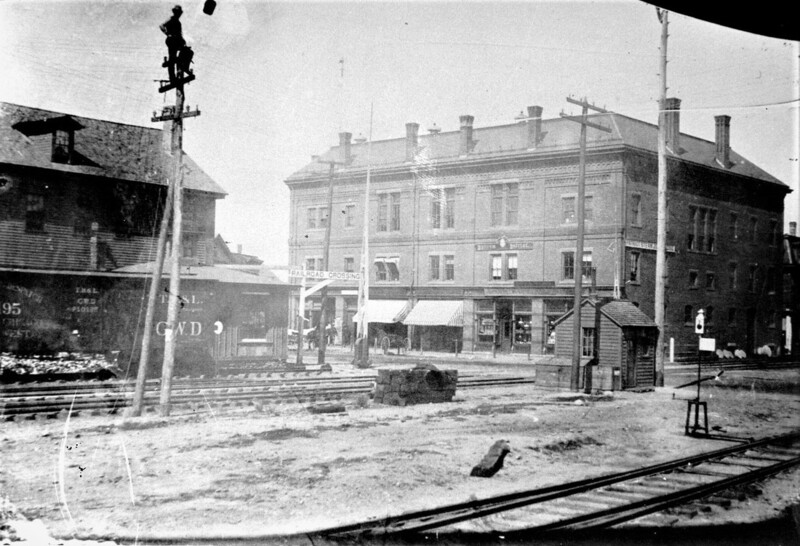 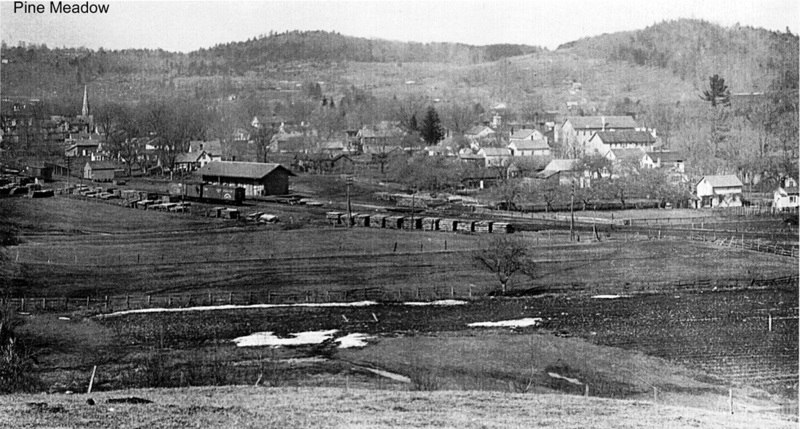 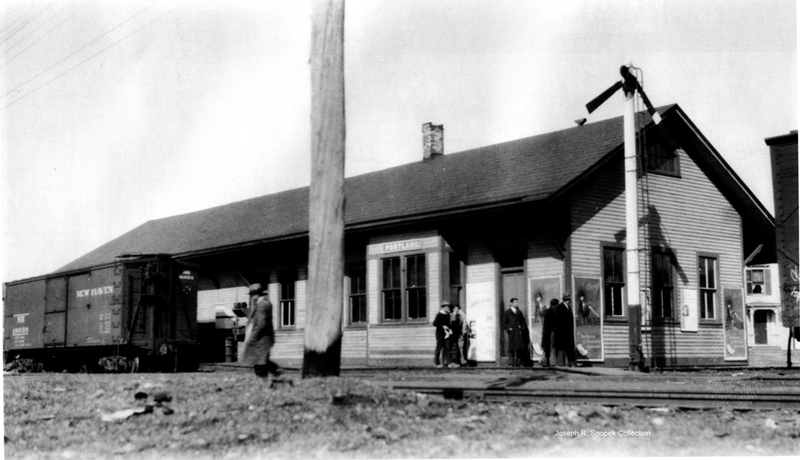 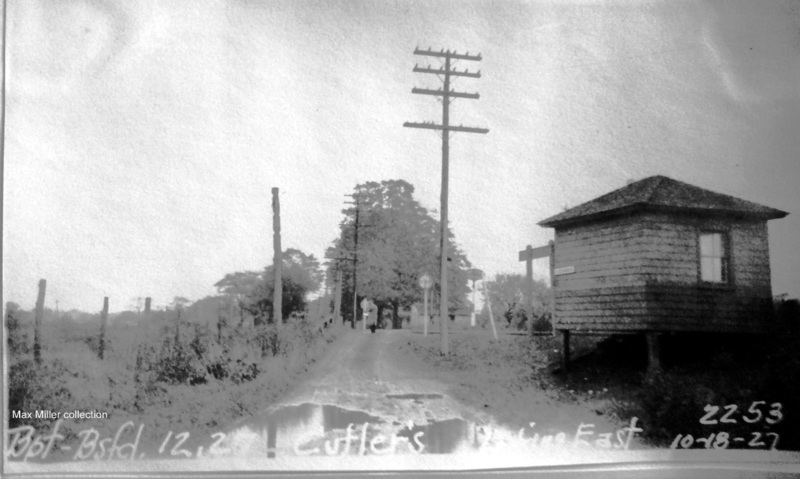 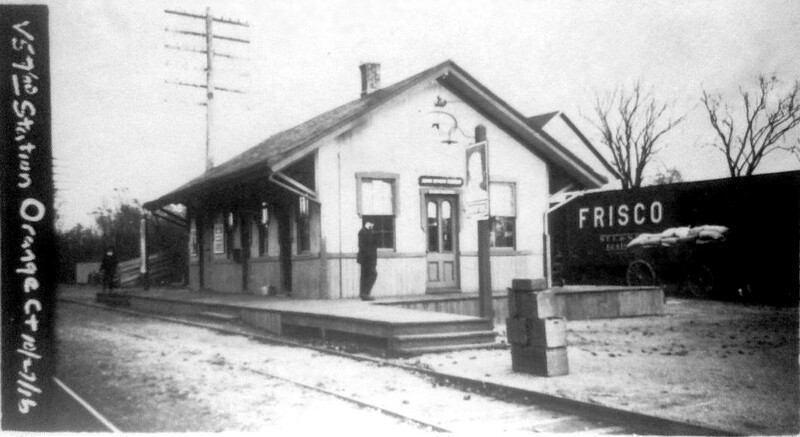 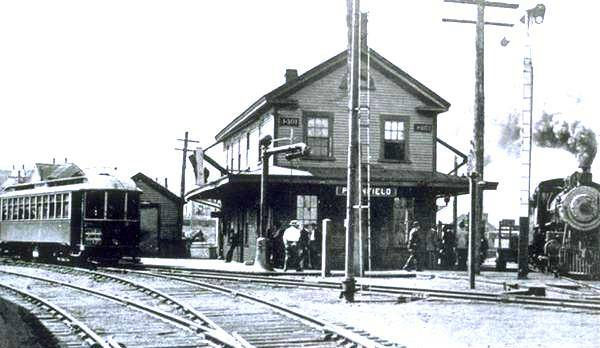 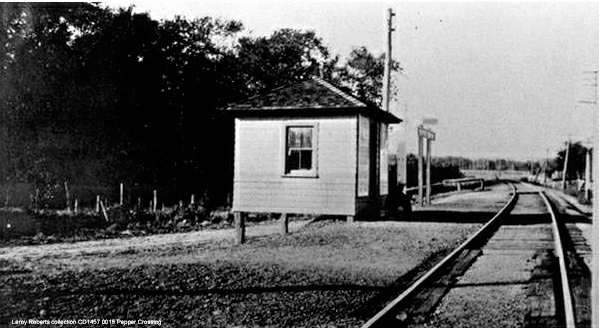 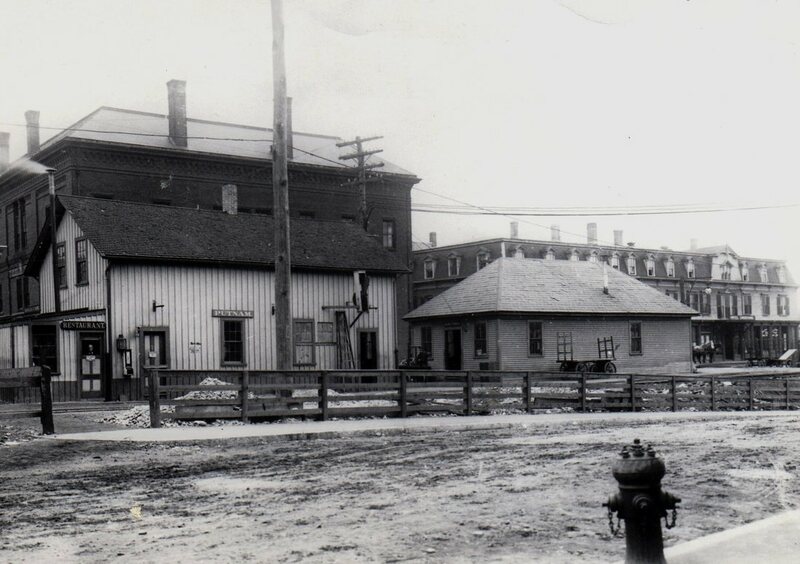 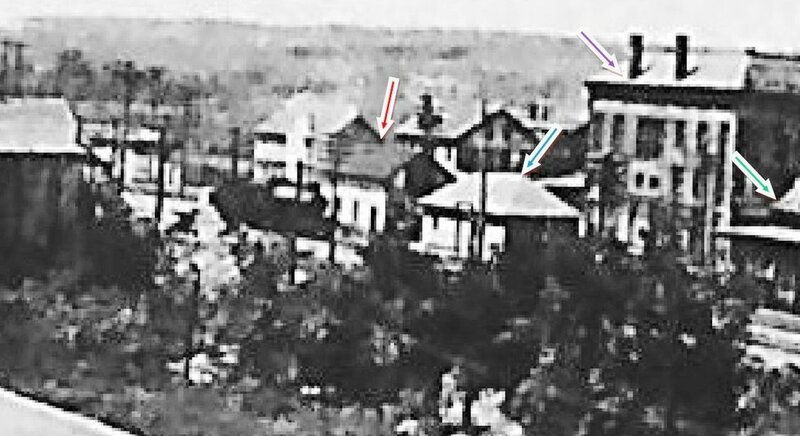 In the 8/30/1916 val photo at left, the corner of his 1900s-era home is visible and it still looks out over the former station site today. 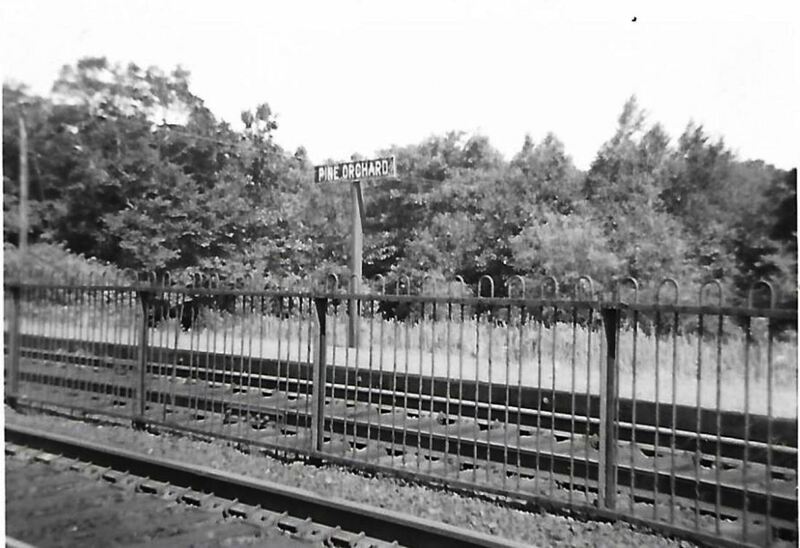 Closer examination of this photo leads us to believe that the valuation photographer has caught the station up on some kind of moving device about to be shunted perhaps onto a flat car. 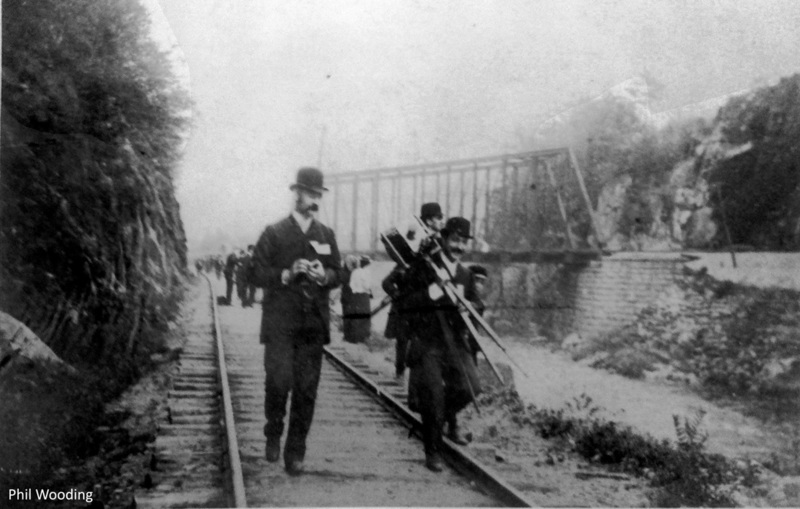 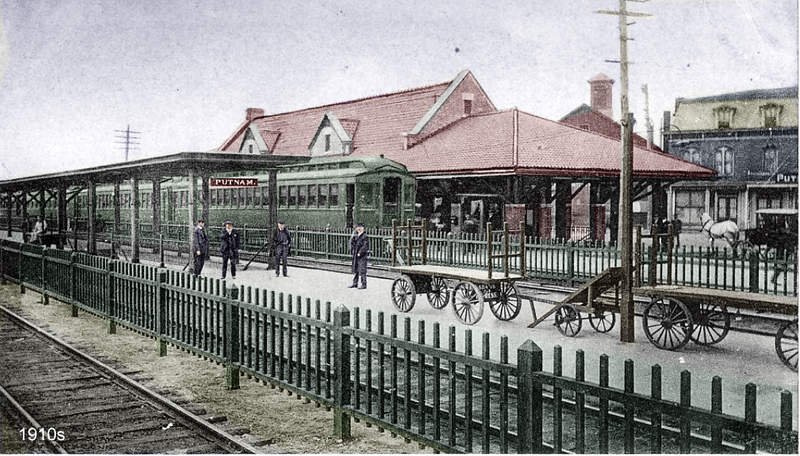 Passenger service would end in 1917. 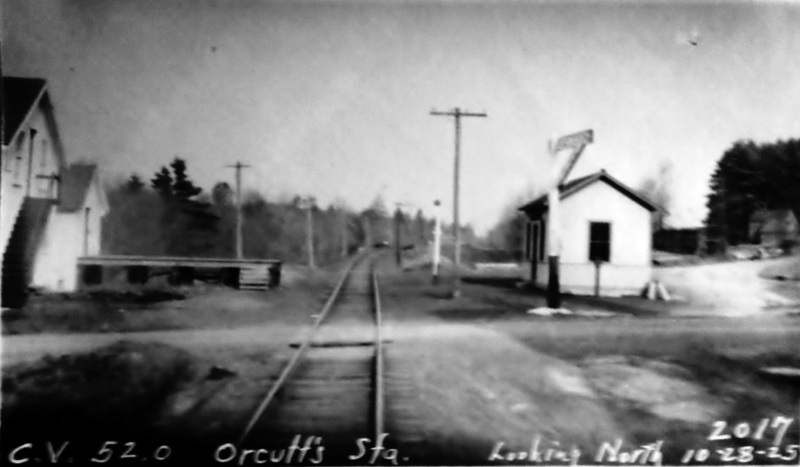 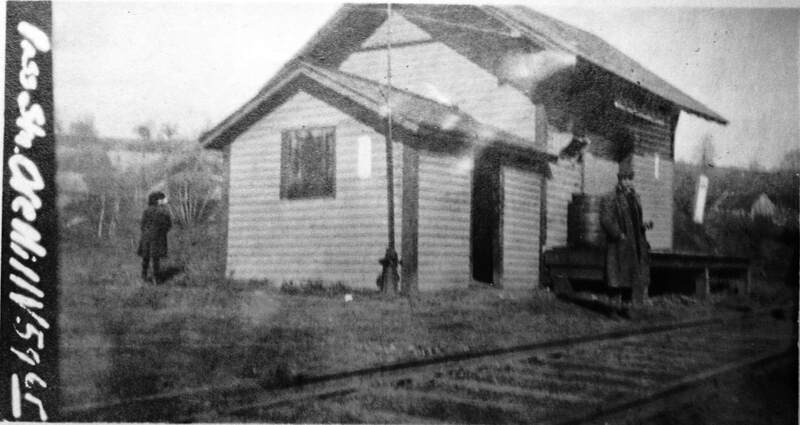 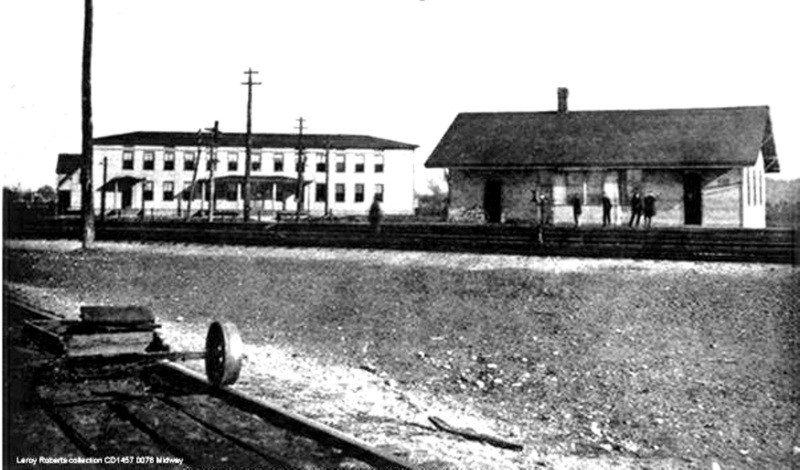 The coach is actually on the stub-ended siding behind the station, where the box car appears in the panoramic photo at right. 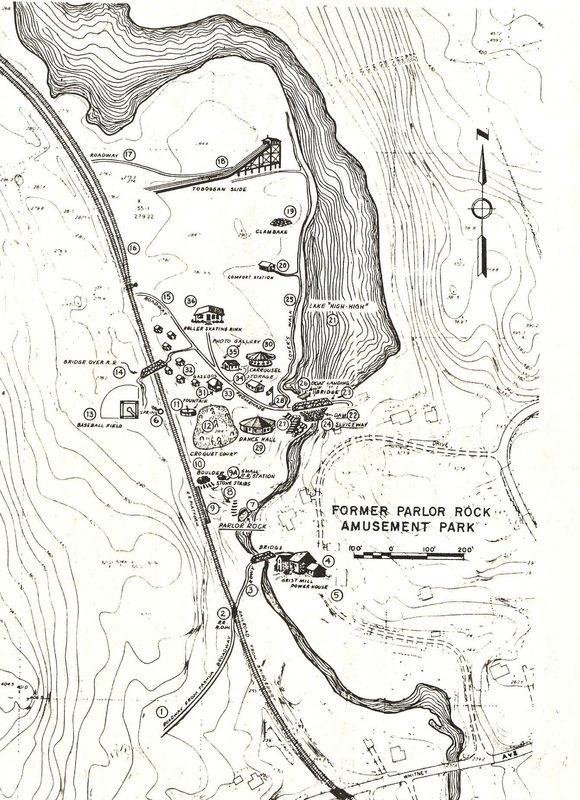 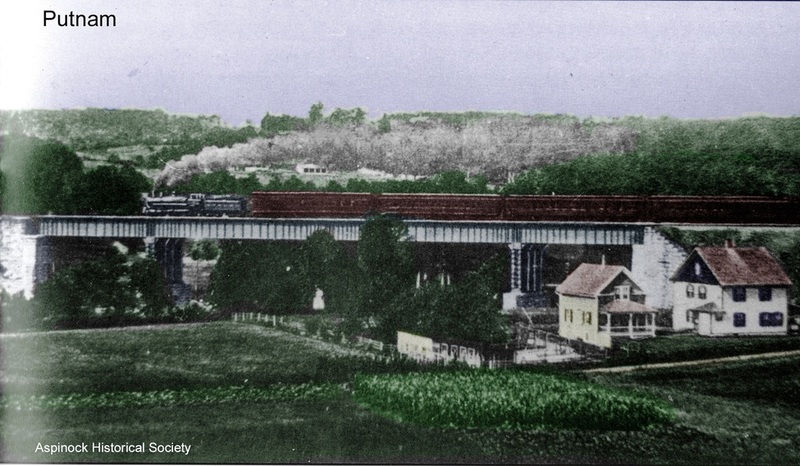 That shot looks north from the Laurel Grove hotel resort, known earlier as Dunham's Grove, a popular picnic spot that generated some traffic for the railroad. 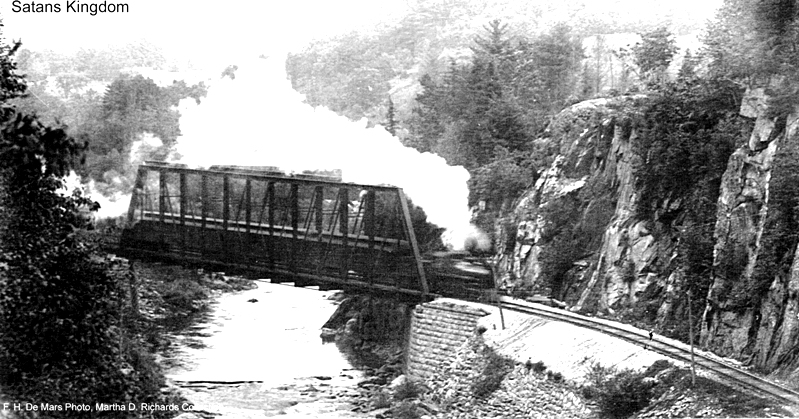 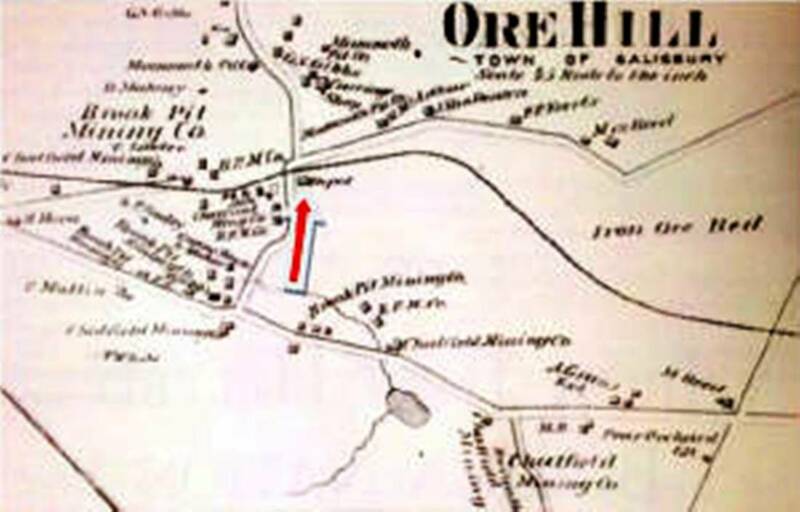 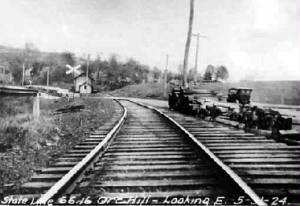 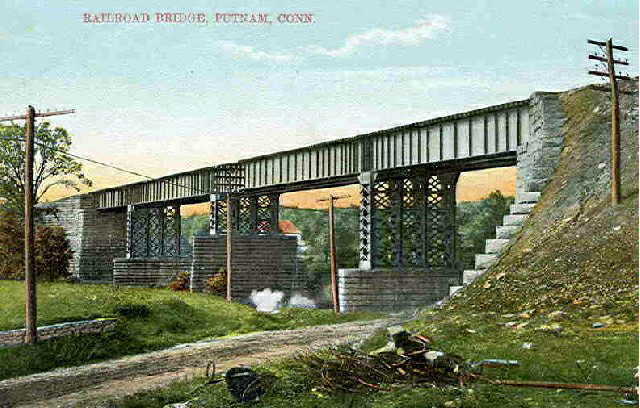 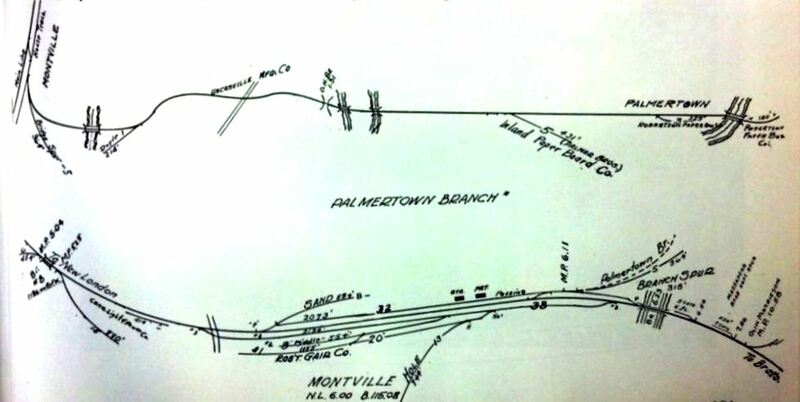 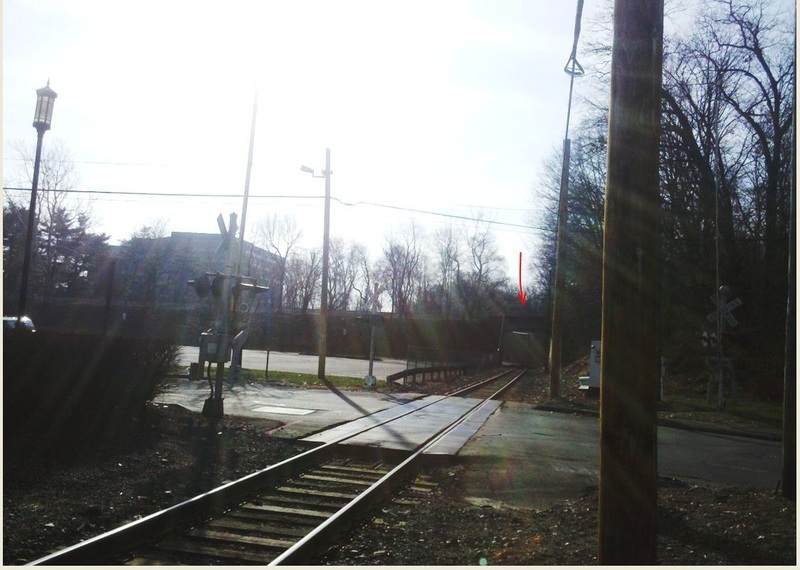 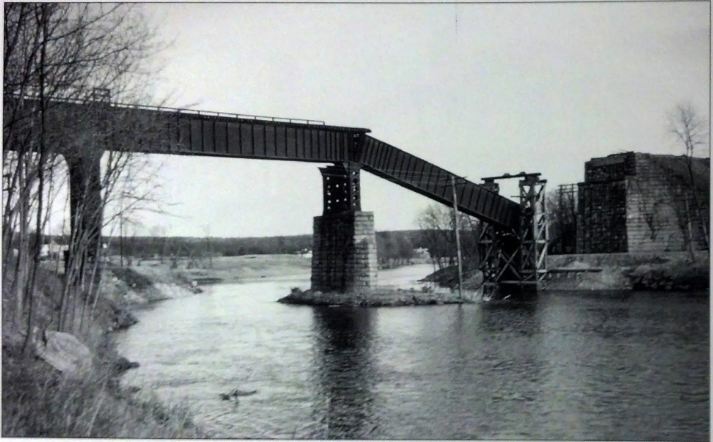 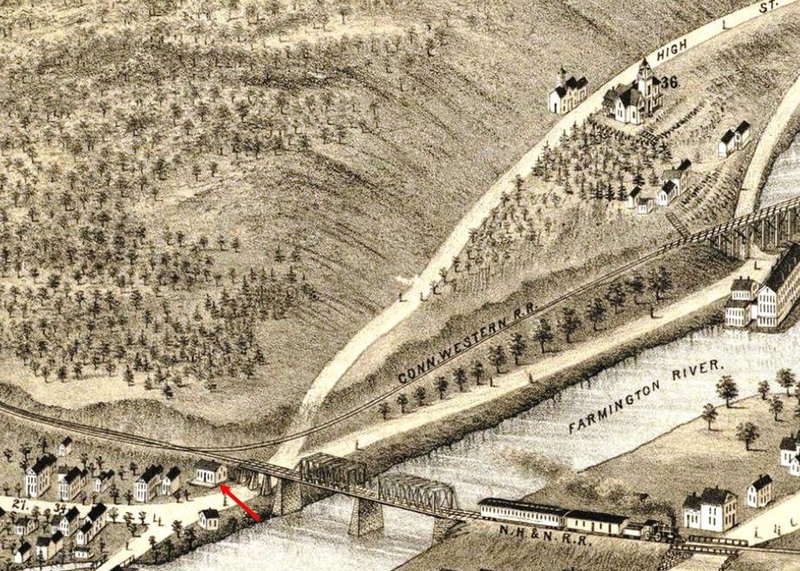 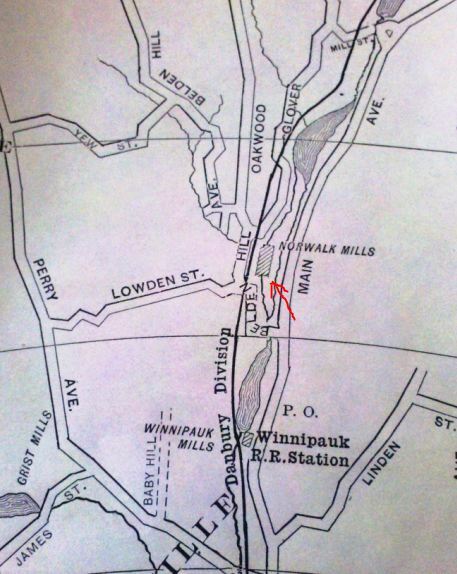 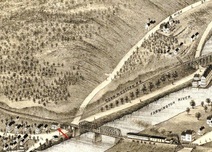 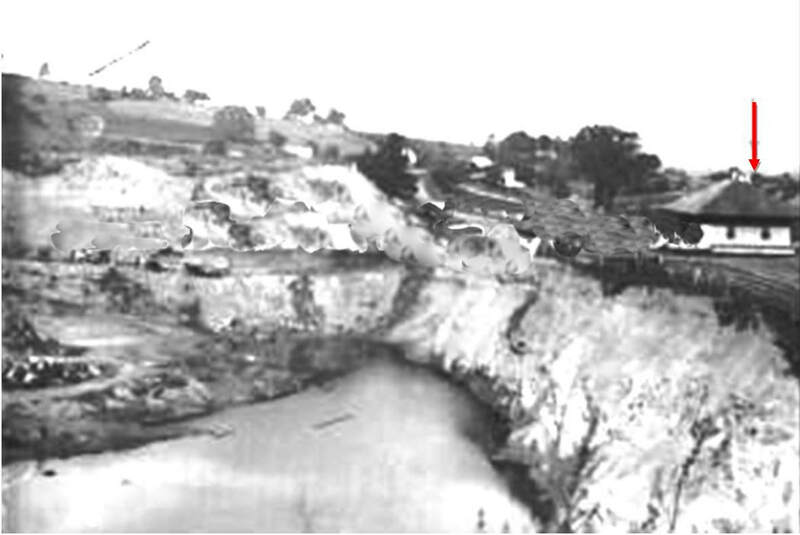 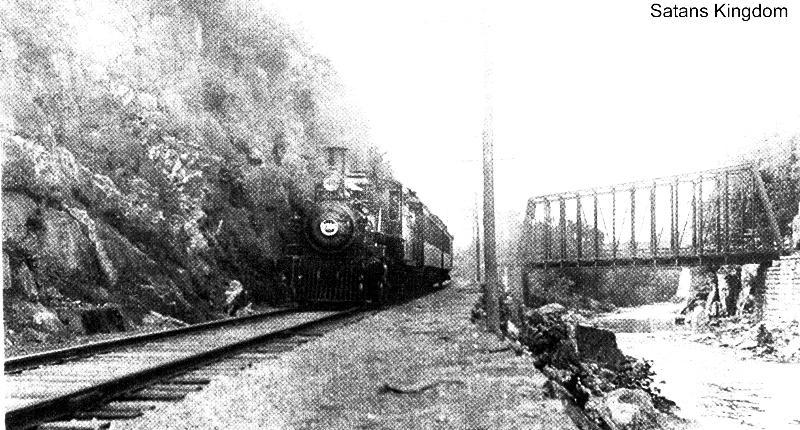 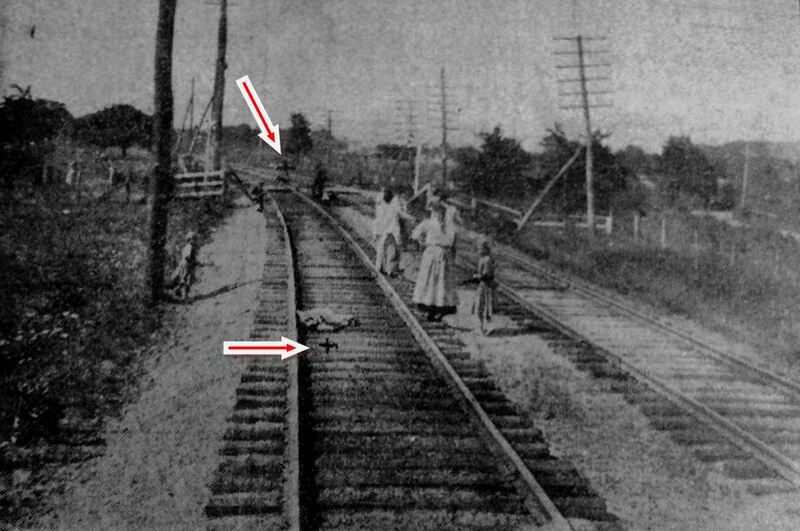 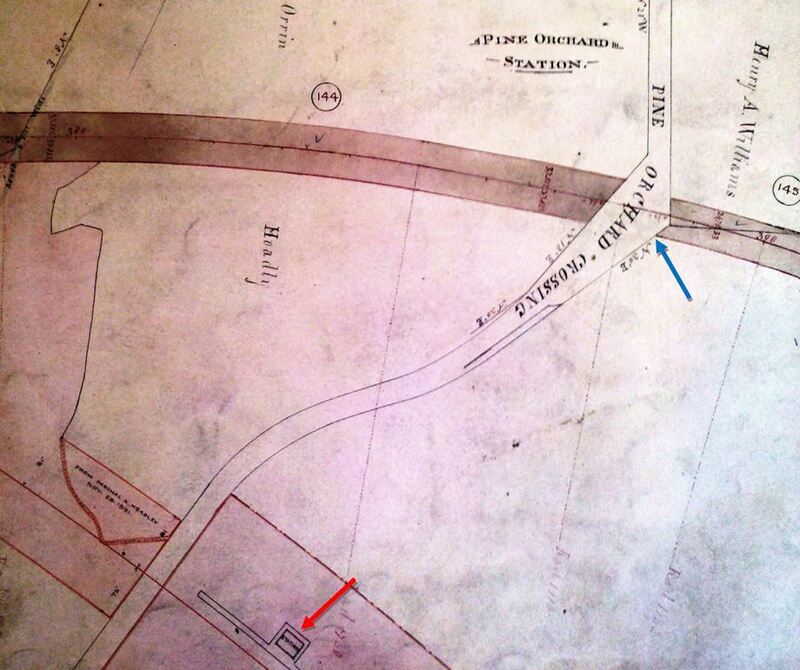 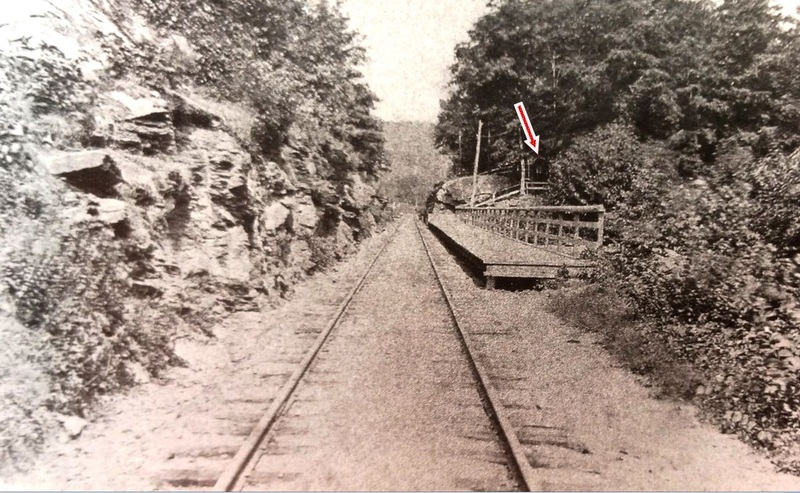 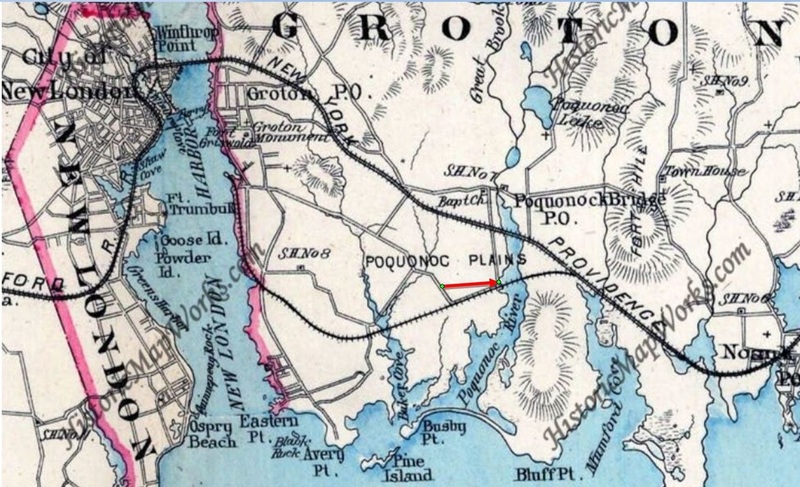 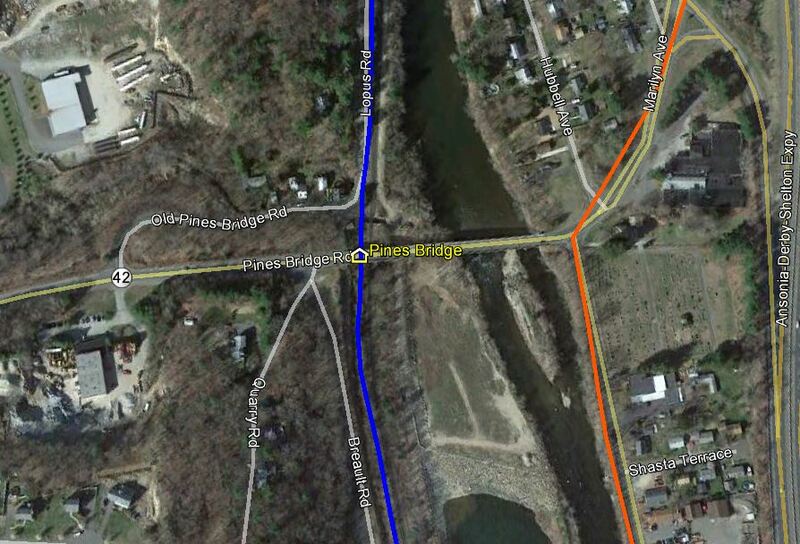 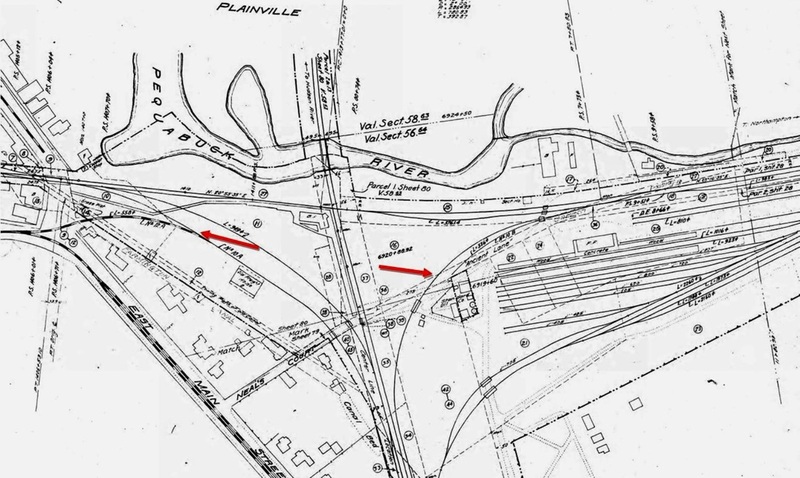 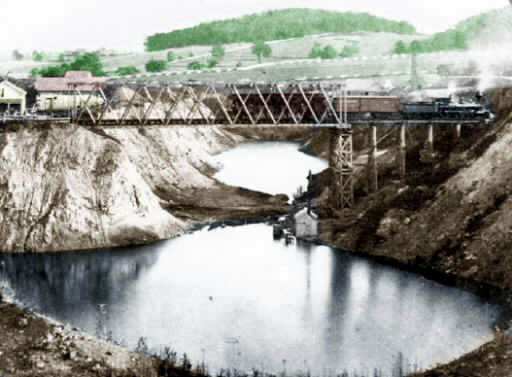 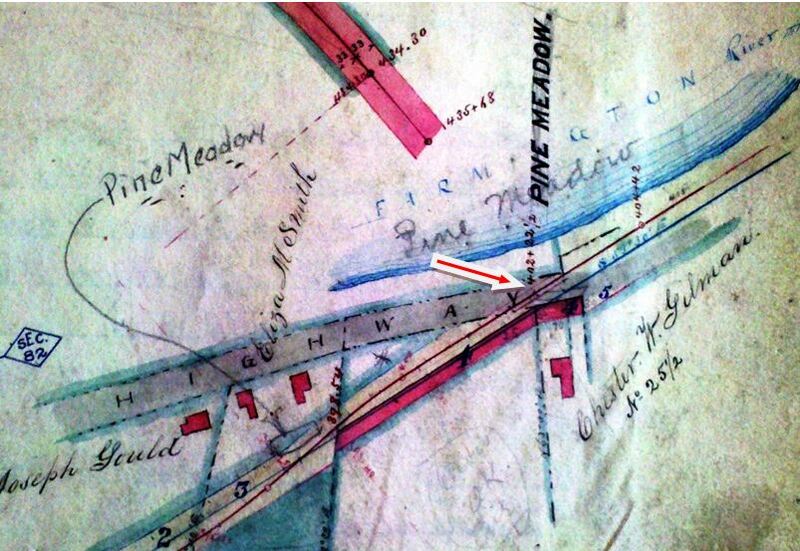 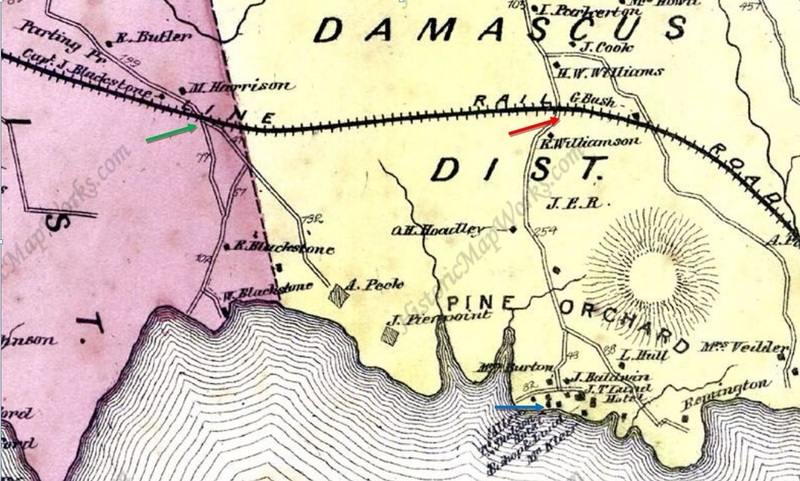 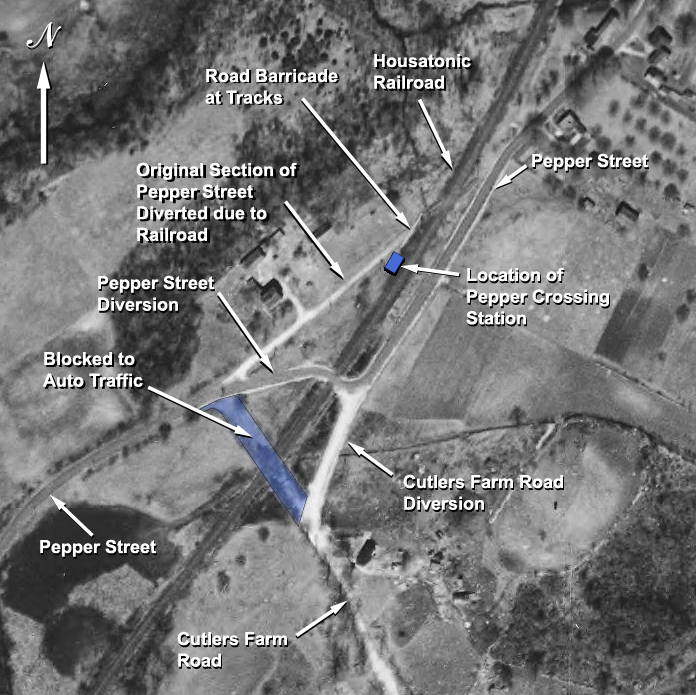 Perhaps the blue arrow indicates a flag stop for the grove that was perched on a high bluff and separated from the PROSPECT station by a deep ravine that the railroad crossed on the curved trestle seen in the photo. 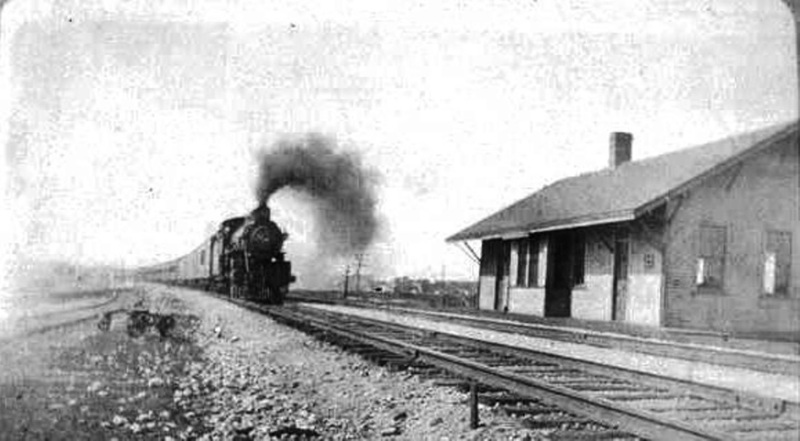 The newspaper said in April, 1906 that the masonry work and foundation for this station were nearly complete and the project now would be pushed in earnest. 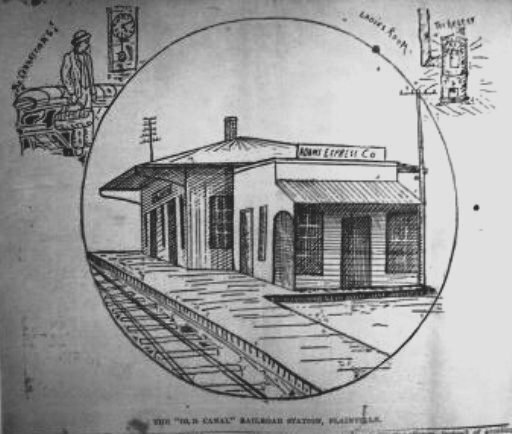 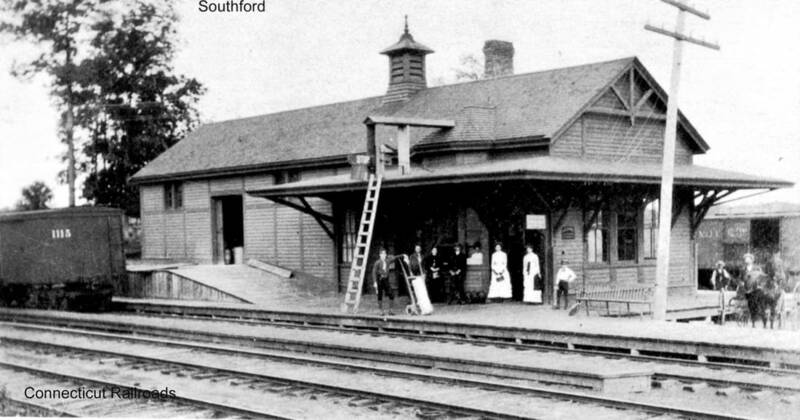 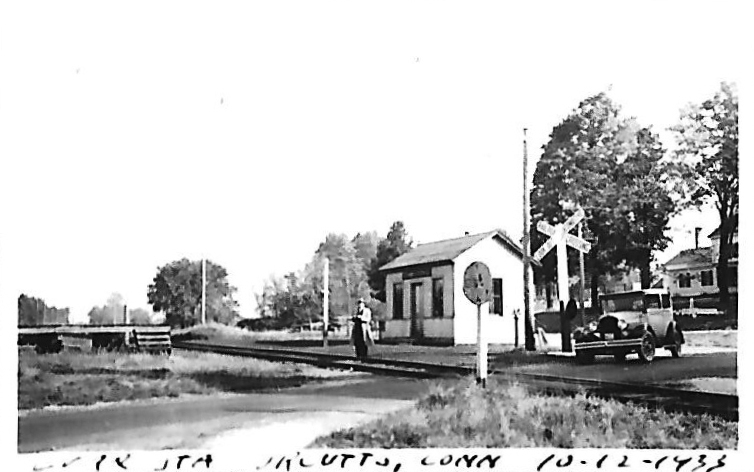 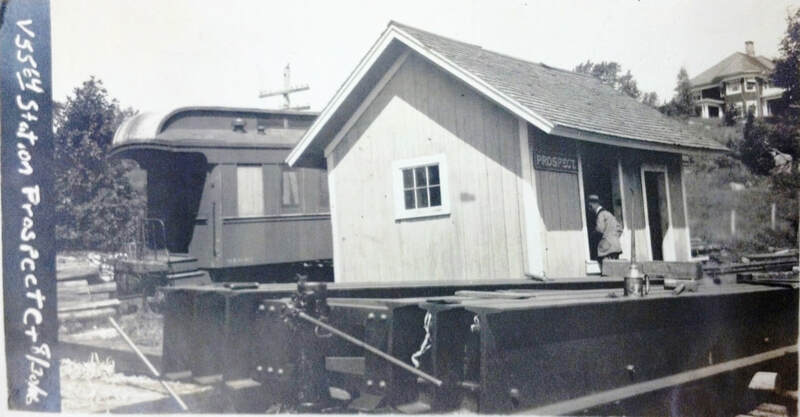 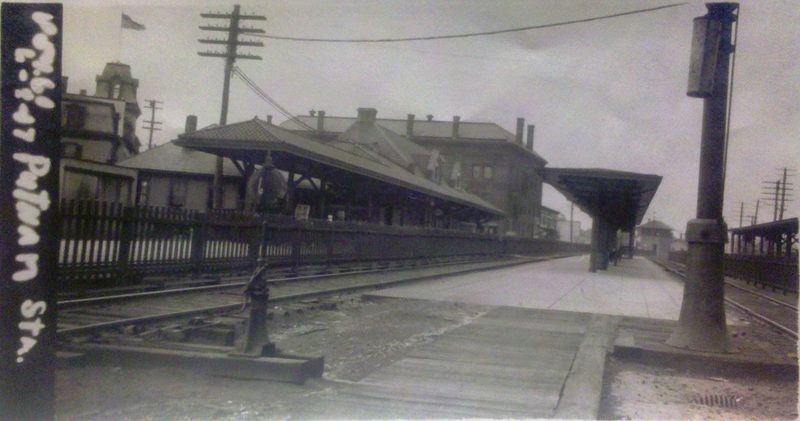 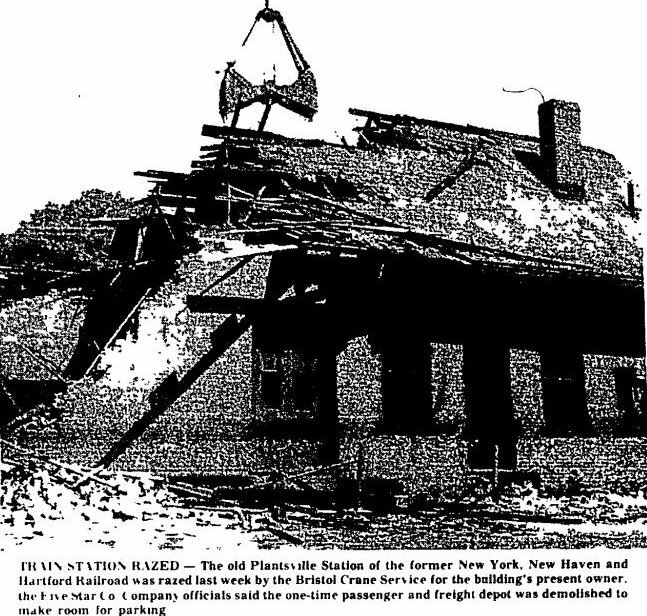 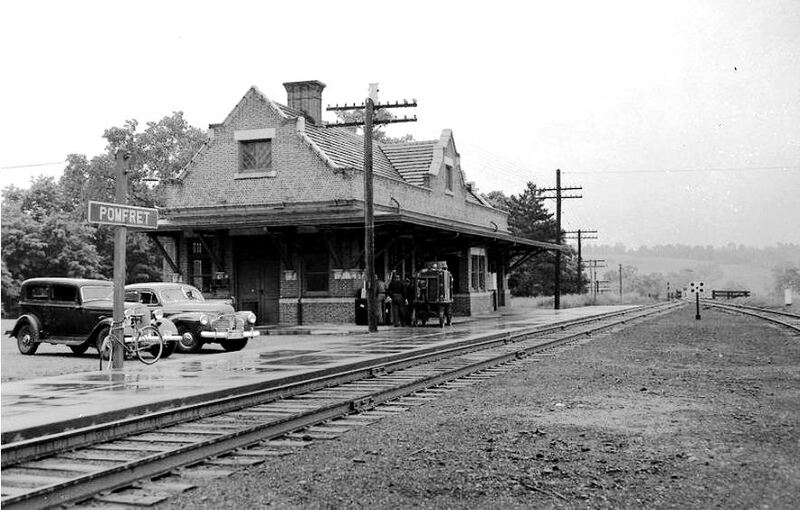 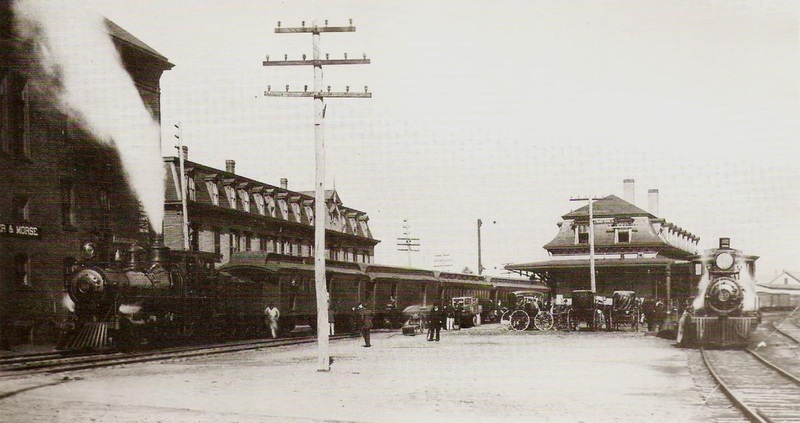 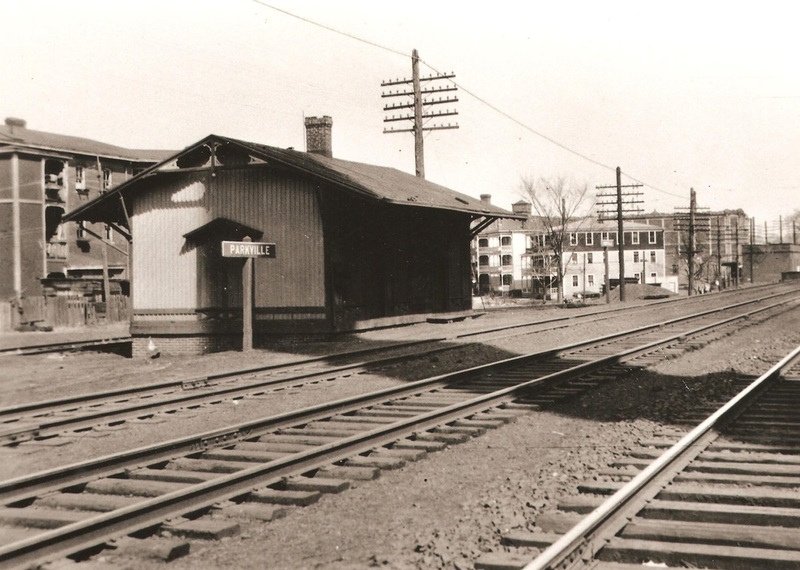 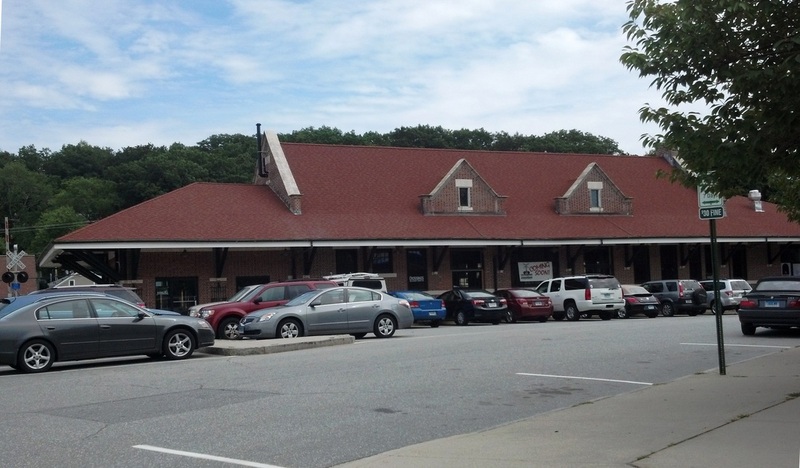 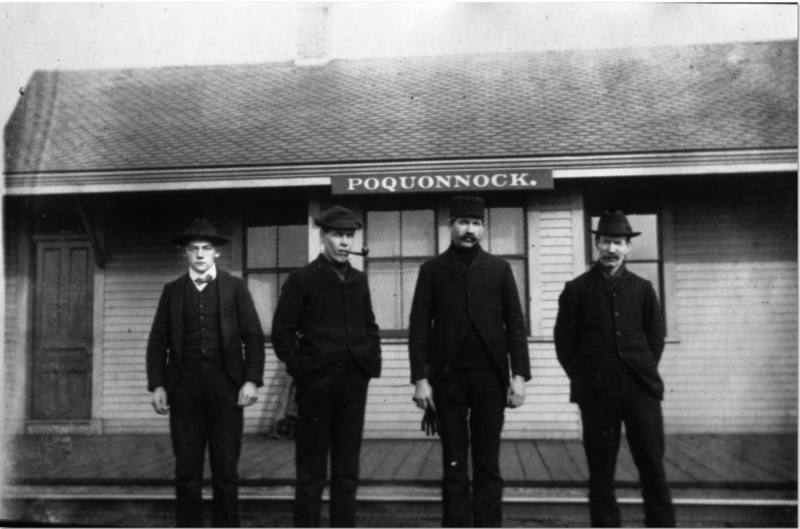 This station would not open until 6/16/1907, but even today the words of the Courant ring true that the "fine location of the new station has given the city a great boost in the right direction, for it now has a more modern and business-like appearance." 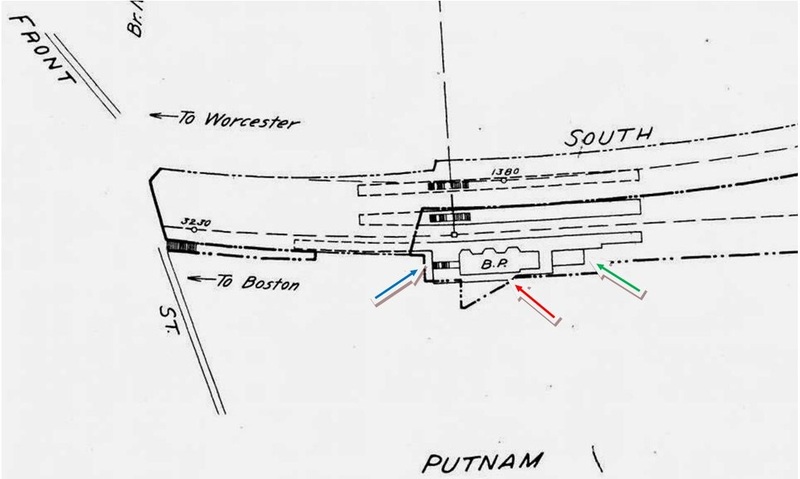 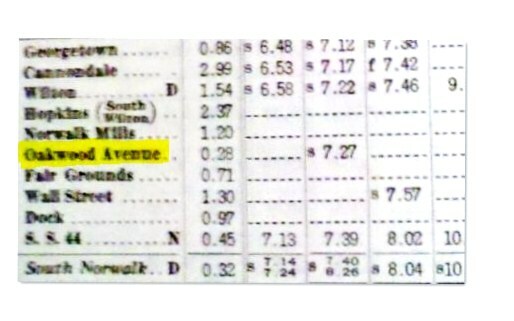 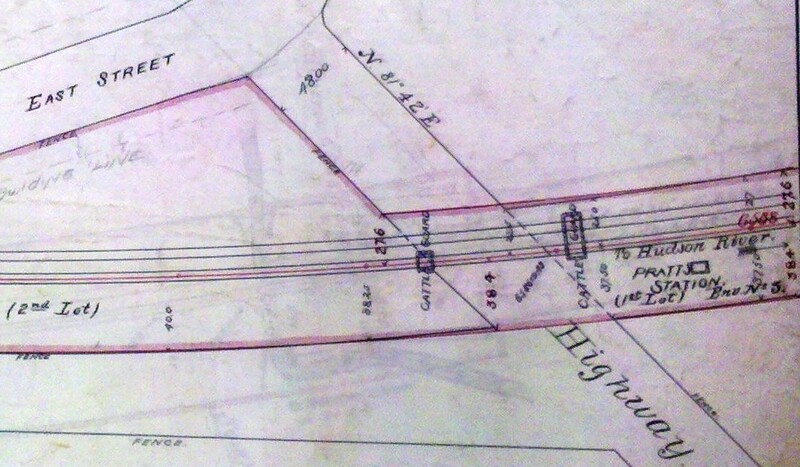 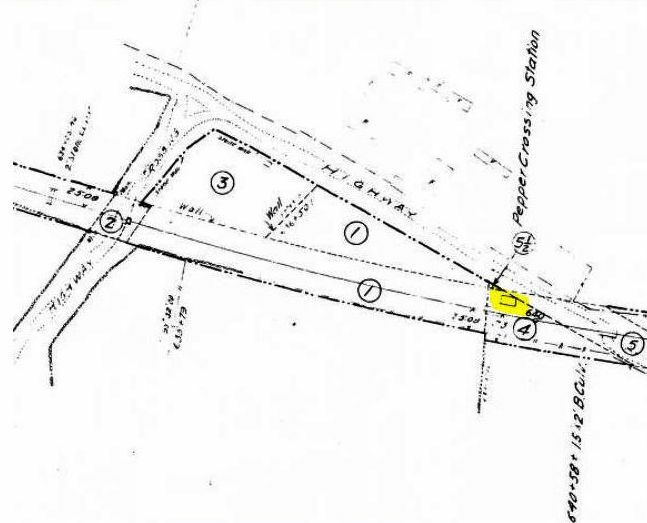 The closing of the Main St. crossing, the extension of South Main St. up to Front St., and the construction of a subway under the tracks at the new station, for the use of pedestrians as well as railroad patrons, were other parts of the plan, for which the city was assessed one quarter of the $80,000 cost. The newspaper said the main building was 83x27 feet, with patterned red "Harvard" brickwork and black headers trimmed in terra cotta and brownstone and, like its predecessor, contained a restaurant. 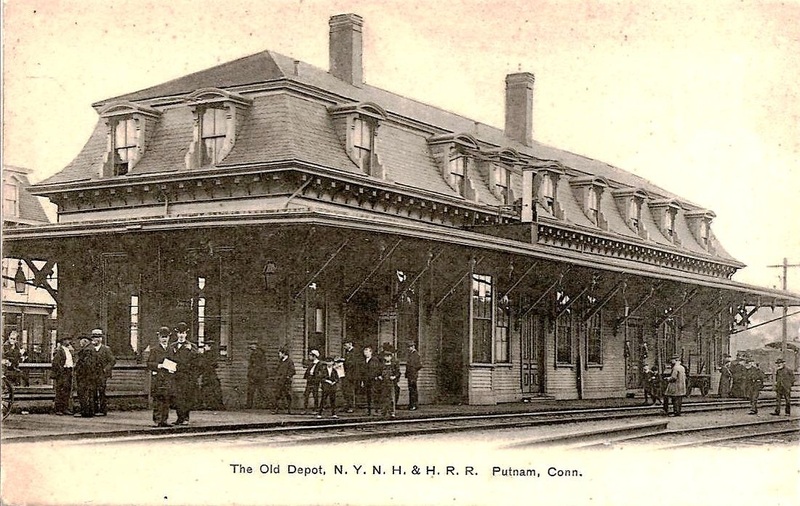 Plans called for a Spanish tile roof, leaded glass, and ornately embossed ceilings all of which embellishments were executed by contractor William Patterson of New Haven. 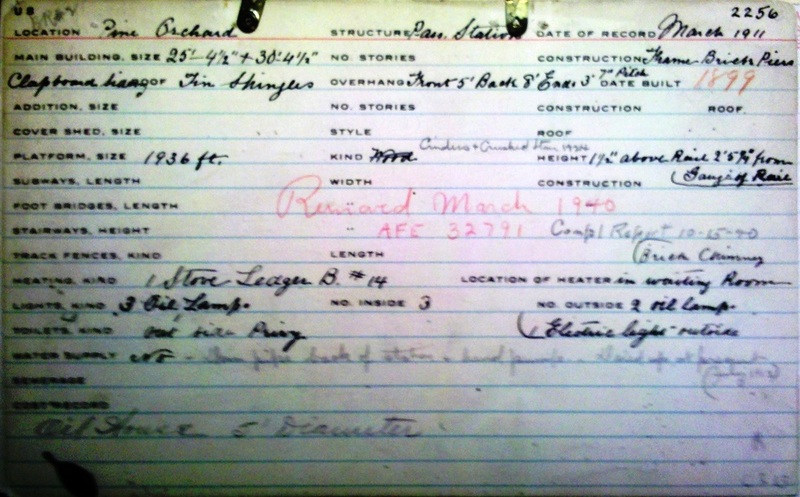 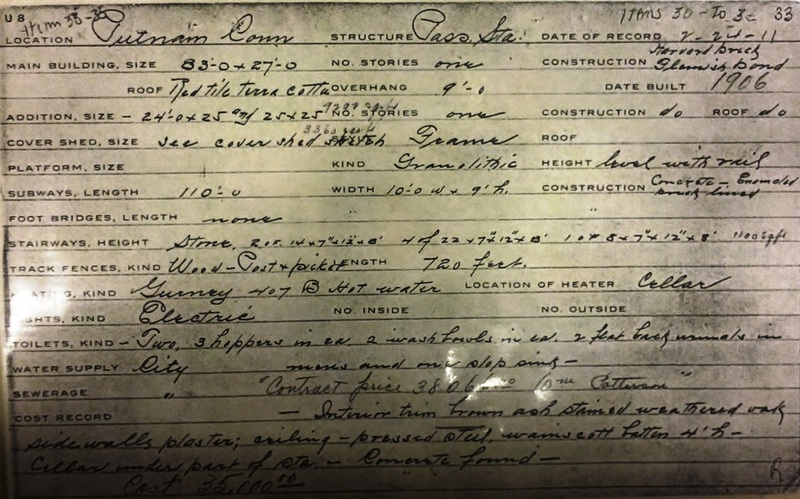 The 2/24/1911 real estate card at  gives some additional details. 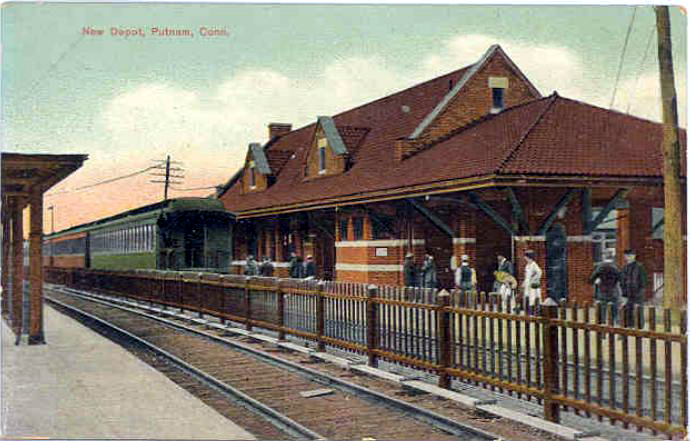 A 100-ft-long pedestrian subway lined with enameled, cream-colored bricks allowed patrons to access the easterly three tracks where two additional coversheds were provided along the 132-ft platform. 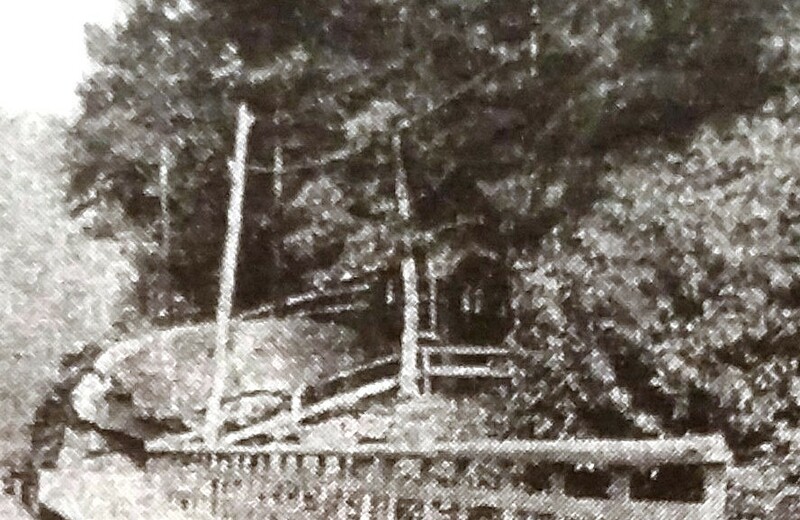 The val photo at  appears to be dated 6/2/1917. 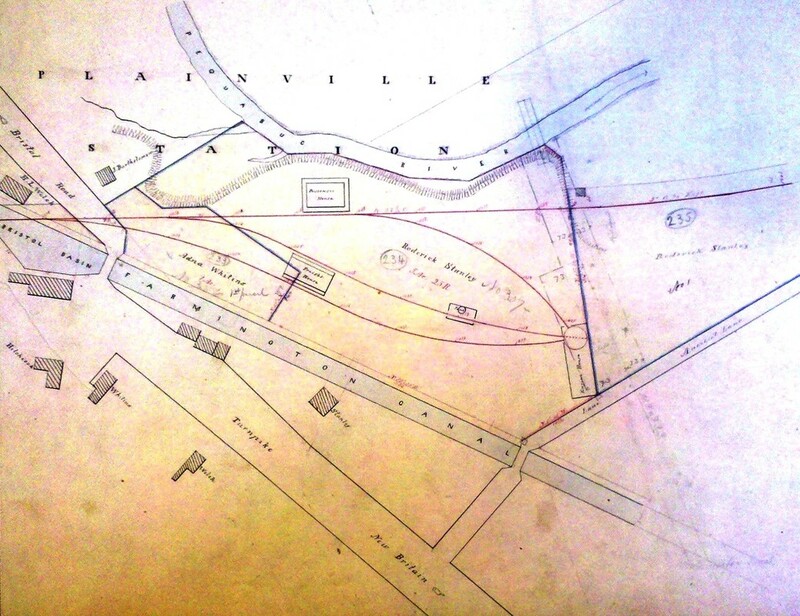 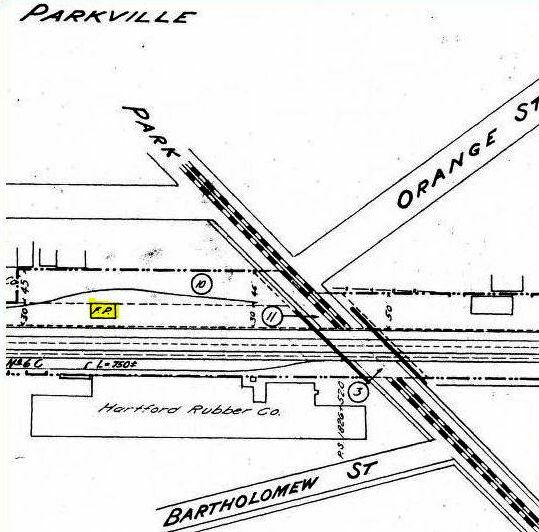 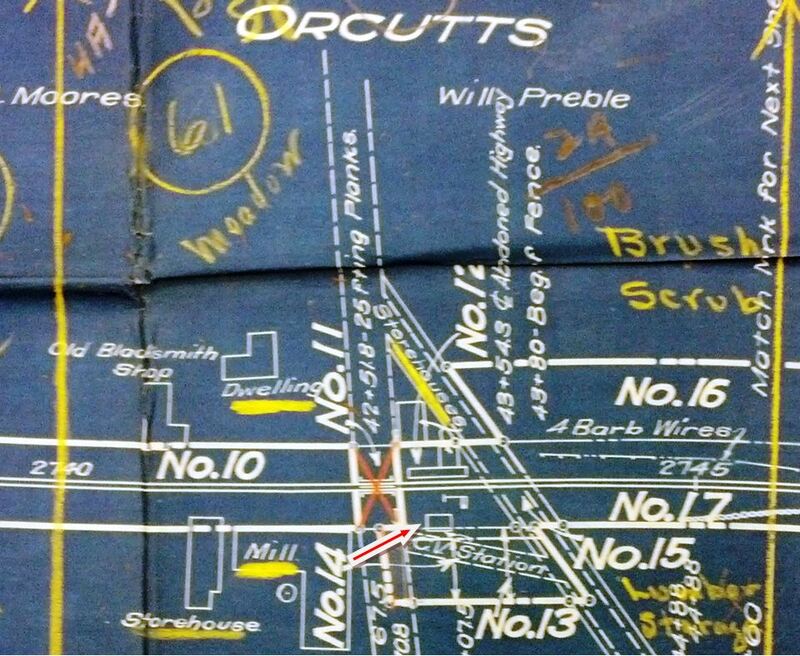 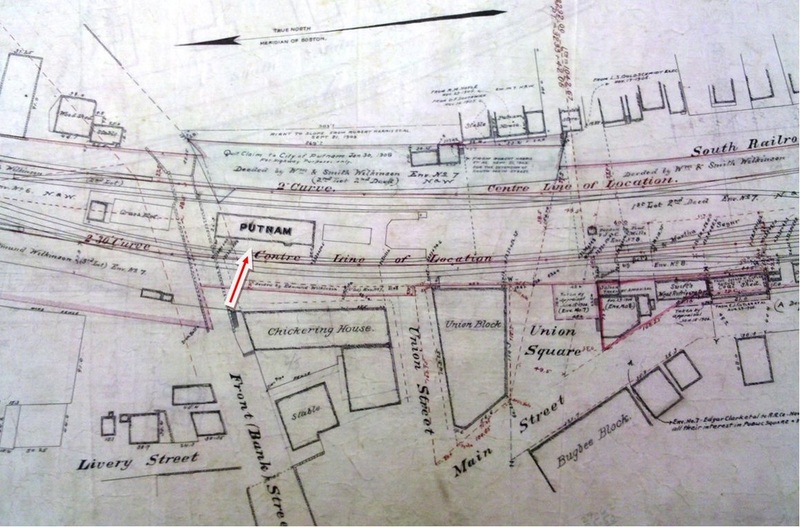 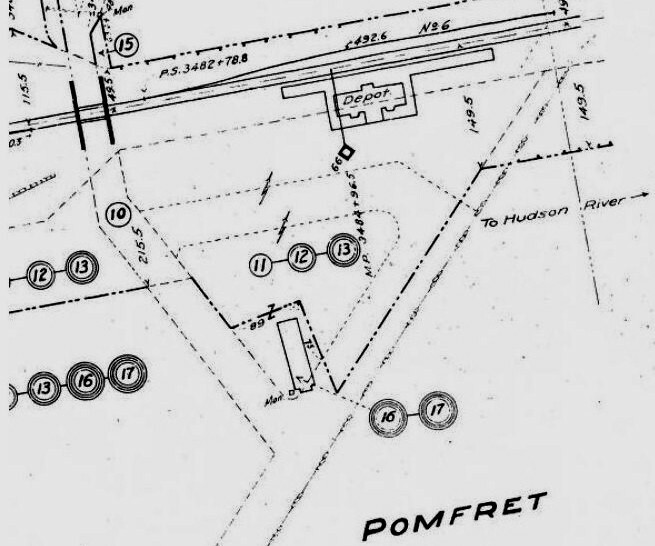 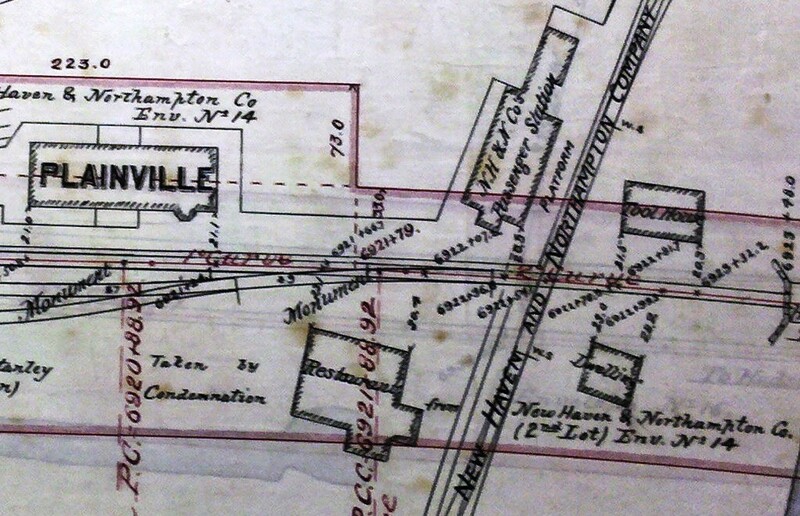 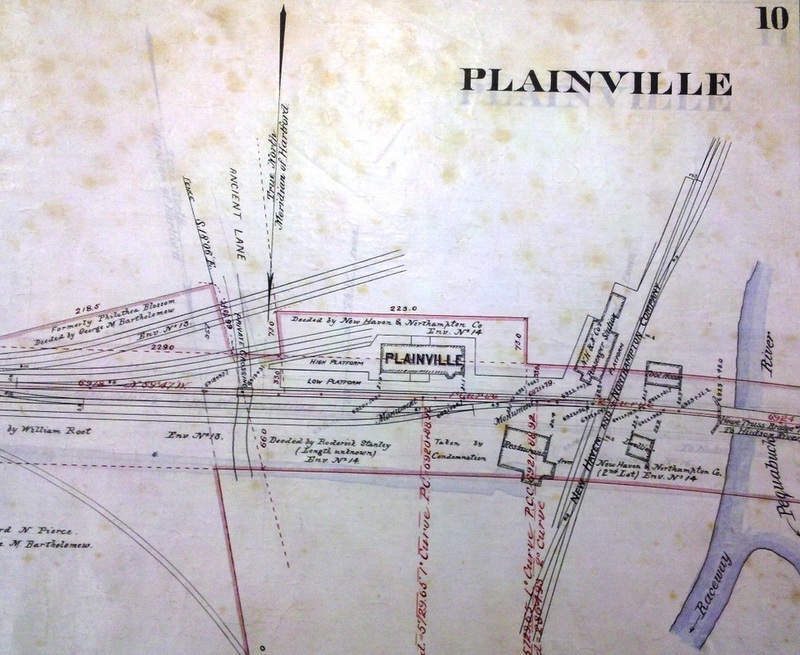 The 1915 val map at  shows 'BP' for the brick passenger station at the red arrow and the stairs from the depot to the subway at the blue arrow. 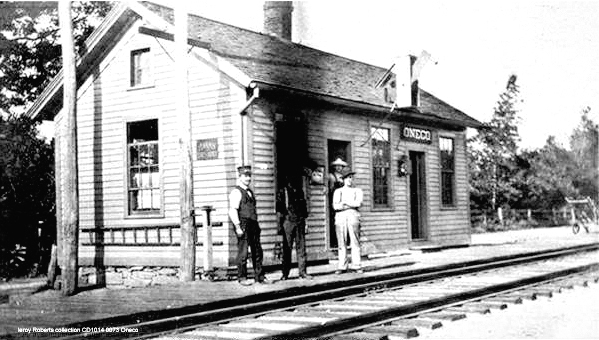 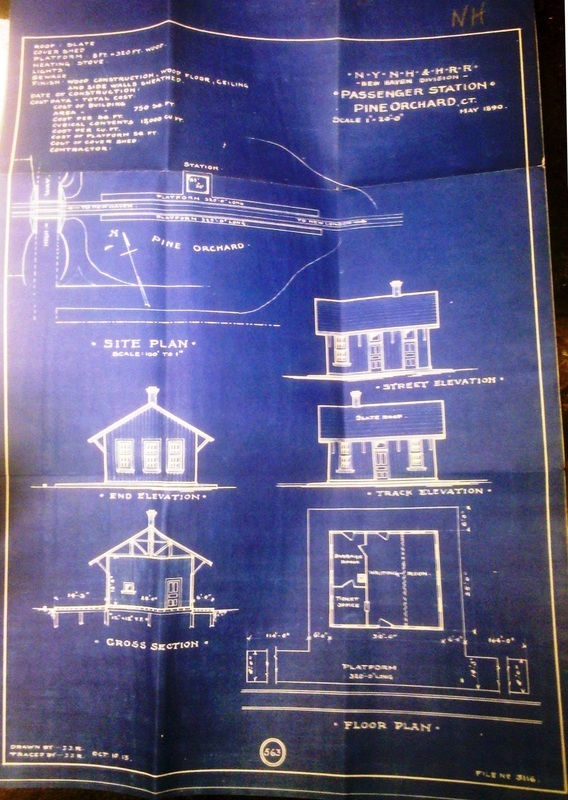 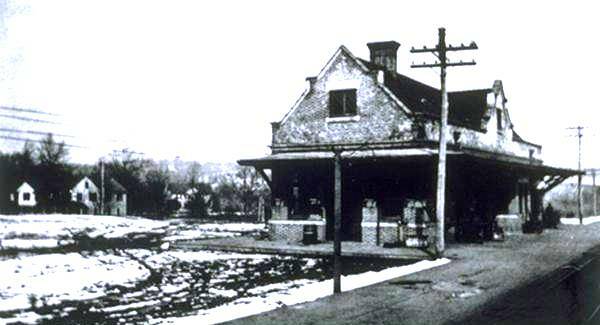 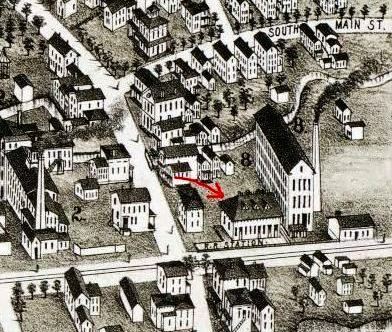 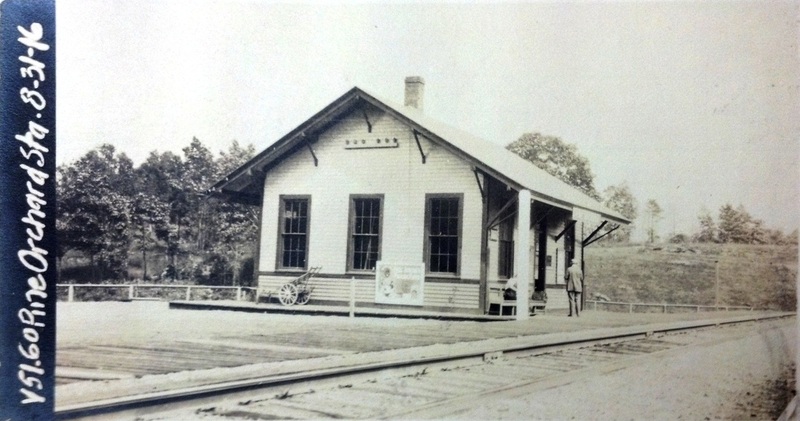 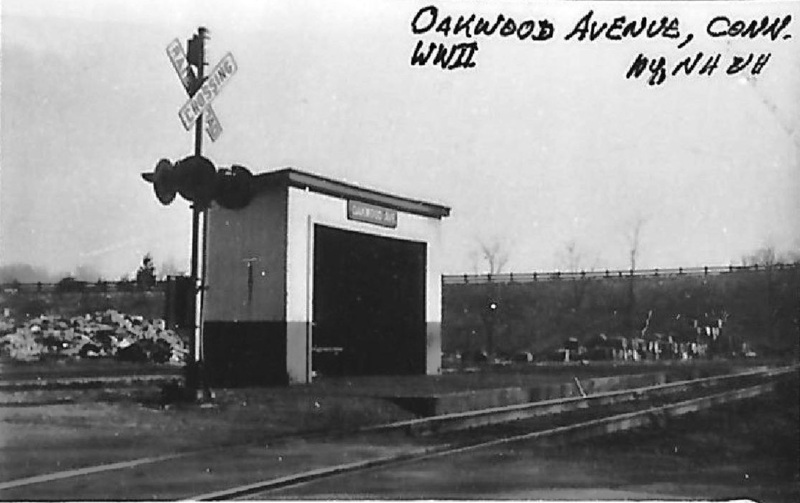 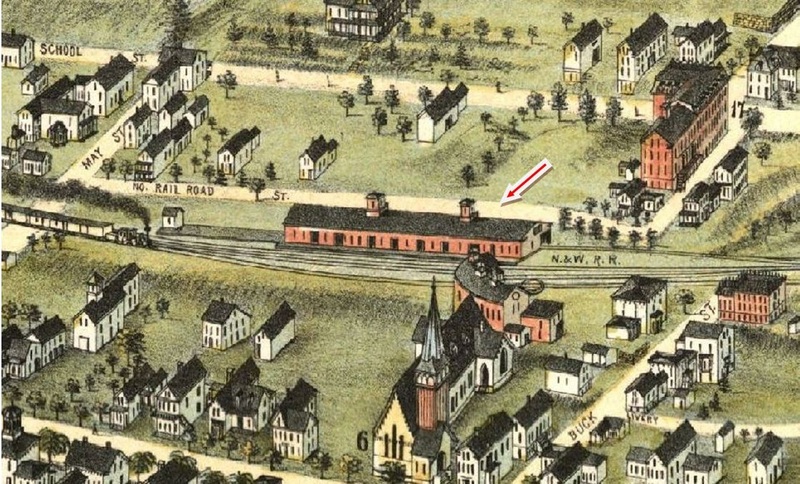 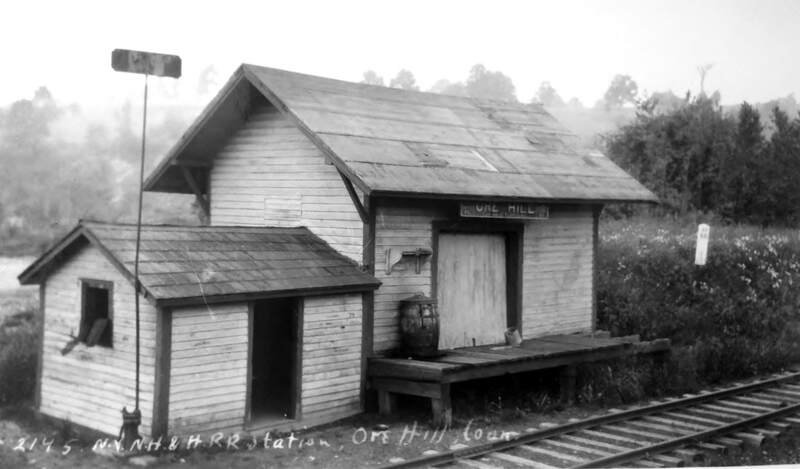 The old Adams Express Office, relocated to the south end of the station, is seen on the val map at the green arrow and, still extant today, in the photo at . 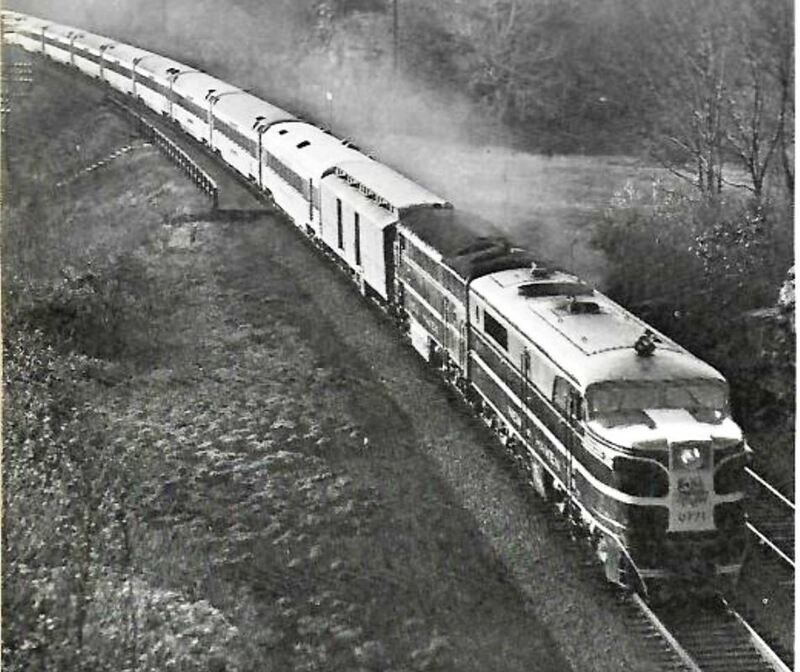 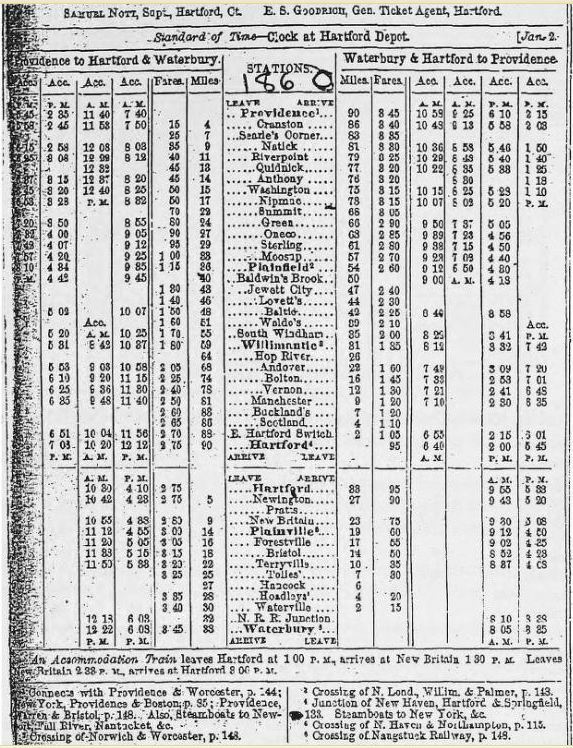 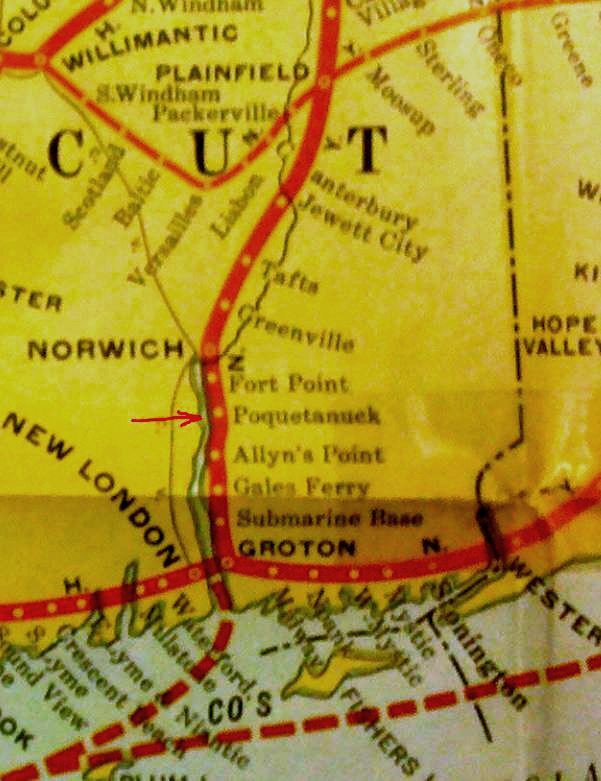 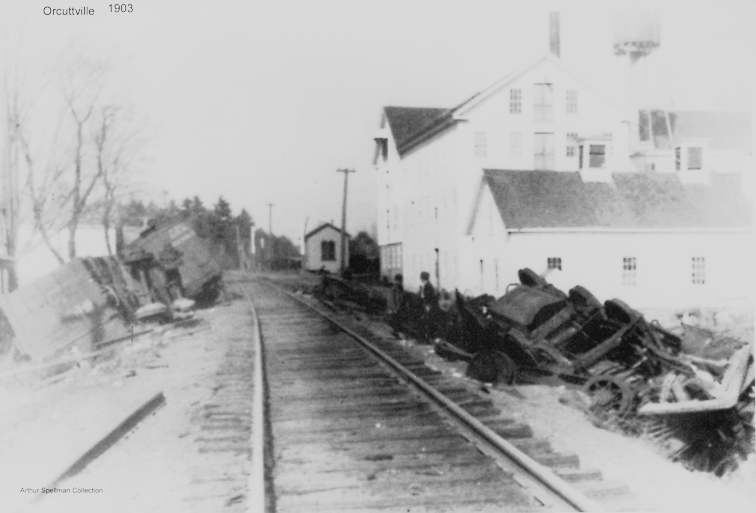 By the 1940s, rail passenger service on the N&W had dwindled to the daily, bi-directional State of Maine that was rerouted via the Shore Line on 4/28/1946. 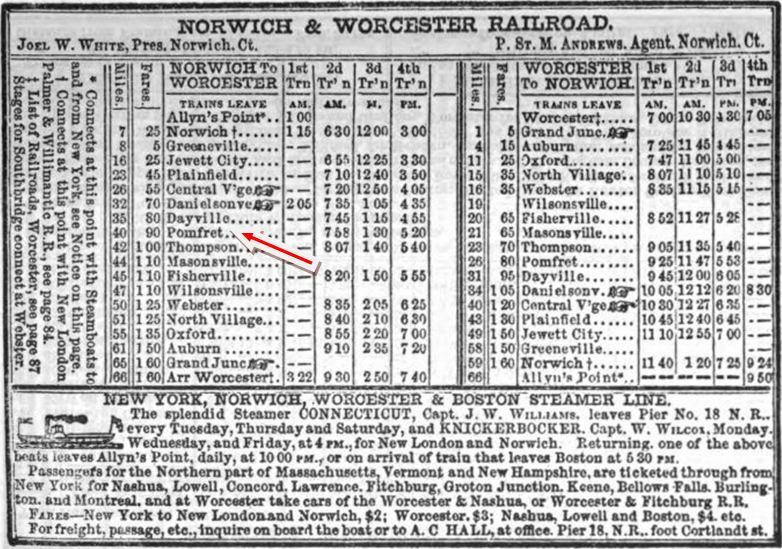 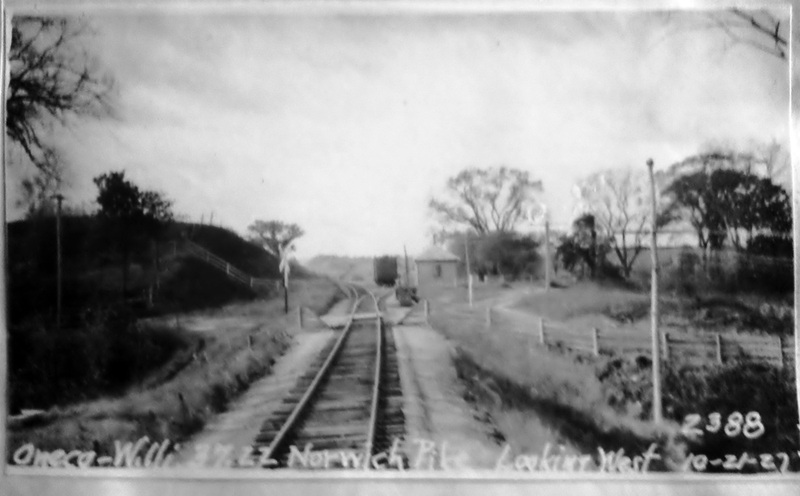 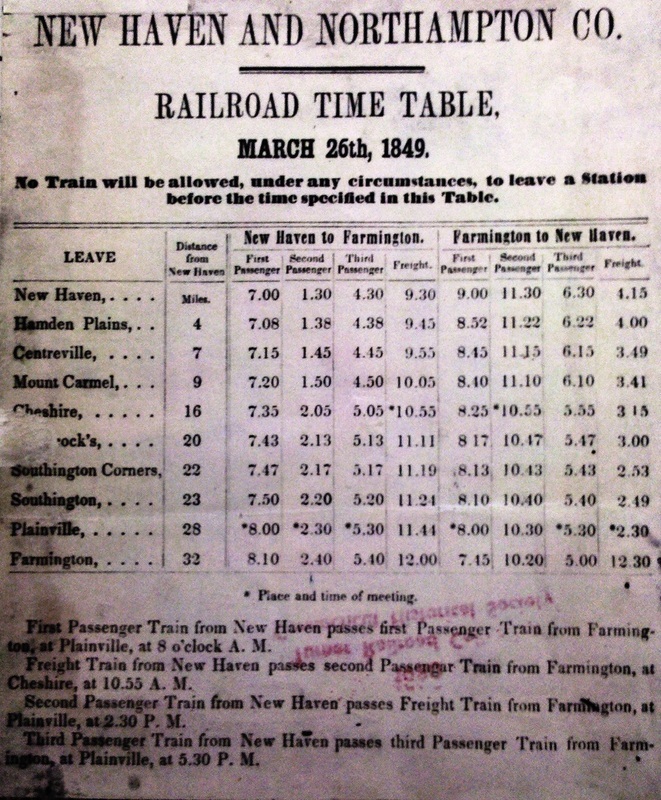 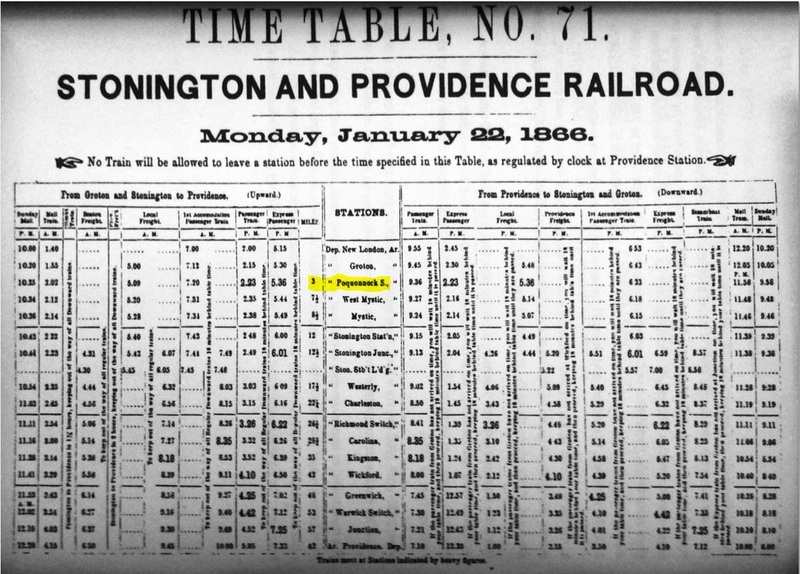 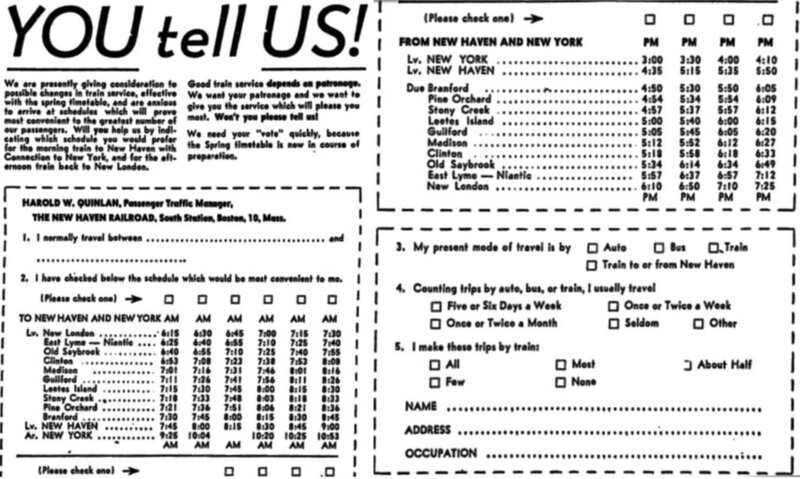 At that time officials said that riders on the N&W line were "'out of luck' due to a lack of public necessity," while bus service at least ran from New London to Norwich.